How pancreatic β-cells acquire function in vivo is a long-standing mystery due to the lack of technology to visualize β-cell function in living animals. Here, we applied a high-resolution two-photon light-sheet microscope for the first in vivo imaging of Ca2+activity of every β-cell in Tg (ins:Rcamp1.07) zebrafish. We reveal that the heterogeneity of β-cell functional development in vivo occurred as two waves propagating from the islet mantle to the core, coordinated by islet vascularization. Increasing amounts of glucose induced functional acquisition and enhancement of β-cells via activating calcineurin/nuclear factor of activated T-cells (NFAT) signaling. Conserved in mammalians, calcineurin/NFAT prompted high-glucose-stimulated insulin secretion of neonatal mouse islets cultured in vitro. However, the reduction in low-glucose-stimulated insulin secretion was dependent on optimal glucose but independent of calcineurin/NFAT. Thus, combination of optimal glucose and calcineurin activation represents a previously unexplored strategy for promoting functional maturation of stem cell-derived β-like cells in vitro. When the amount of sugar in our body rises, specialised cells known as β-cells respond by releasing insulin, a hormone that acts on various organs to keep blood sugar levels within a healthy range. These cells cluster in small ‘islets’ inside our pancreas. If the number of working β-cells declines, diseases such as diabetes may appear and it becomes difficult to regulate the amount of sugar in our bodies. Understanding how β-cells normally develop and mature in the embryo could help us learn how to make new ones in the laboratory. In particular, researchers are interested in studying how different body signals, such as blood sugar levels, turn immature β-cells into fully productive cells. However, in mammals, the pancreas and its islets are buried deep inside the embryo and they cannot be observed easily. Here, Zhao et al. circumvented this problem by doing experiments on zebrafish embryos, which are transparent, grow outside their mother’s body, and have pancreatic islets that are similar to the ones found in mammals. A three-dimensional microscopy technique was used to watch individual β-cells activity over long periods, which revealed that the cells start being able to produce insulin at different times. The β-cells around the edge of each islet were the first to have access to blood sugar signals: they gained their hormone-producing role earlier than the cells in the core of an islet, which only sensed the information later on. Zhao et al. then exposed the zebrafish embryos to different amounts of sugar. This showed that there is an optimal concentration of sugar which helps β-cells develop by kick-starting a cascade of events inside the cell. Further experiments confirmed that the same pathway and optimal sugar concentration exist for mammalian islets grown in the laboratory. These findings may help researchers find better ways of making new β-cells to treat diabetic patients. In the future, using the three-dimensional imaging technique in zebrafish embryos may lead to more discoveries on how the pancreas matures. Pancreatic β-cells secrete insulin to regulate glucose metabolism. Insufficient functional β-cell mass leads to glucose intolerance and diabetes. Researchers have intensively studied β-cell development for the last two decades to generate new therapeutic approaches for diabetes. Although many of the mechanisms regulating the early development of pancreatic progenitor cells have been discovered (Pan and Wright, 2011), the mechanisms regulating β-cell functional acquisition are still poorly defined (Kushner et al., 2014). The β-cells reside in islets containing endocrine, vascular, neuronal and mesenchymal cells. Various signals arising from this neurovascular milieu, such as gap junctions, neuronal transmitters, endothelial factors and hormones, have been reported to be involved in β-cell development (Borden et al., 2013; Carvalho et al., 2010; Cleaver and Dor, 2012; Omar et al., 2016). These factors may also directly control β-cell functional acquisition, and the related mechanisms need to be studied in vivo. However, the lack of a method to evaluate β-cell function in vivo has hindered the exploration of these fundamental questions. Specifically, β-cell functional development was suggested to be heterogeneous, and this heterogeneous process cannot be studied by simply measuring glucose-stimulated insulin secretion (GSIS) in vivo (Aguayo-Mazzucato et al., 2011; Bader et al., 2016; Blum et al., 2012; Qiu et al., 2018; van der Meulen et al., 2017). Development of a method to visualize individual β-cell function in vivo will overcome this problem (Benninger and Hodson, 2018). The primary function of a mature β-cell is to quickly secrete stored insulin in response to increases in blood glucose concentrations. Glucose-induced Ca2+ influx, which triggers insulin secretion from β-cells, is often used as a functional marker of β-cells (Pagliuca et al., 2014; Rezania et al., 2014; Singh et al., 2017). The extent of Ca2 + influx has been used to assess the level of β-cell maturation: the greater the amount of Ca2+ influx in, the more mature the β-cells will be (Rezania et al., 2014). In isolated islets whose β-cells are labeled with genetically encoded fluorescent Ca2+ indicators, Ca2+ influx in primary β-cells is imaged as an increase in the fluorescent intensity of the indicators due to their conformational change upon Ca2+ binding (Singh et al., 2017; van der Meulen et al., 2017). However, noninvasively imaging Ca2+ transients in β-cells in vivo has not been achieved yet because of the nontransparent pancreas in mammals and the technical challenges in developing high-resolution imaging tools. Here, we used zebrafish as a model animal because its β-cell development is conserved with mammals in general (Supplementary file 1) (Avolio et al., 2013; Qiu et al., 2018; Reinert et al., 2014; Shah et al., 2011; Shih et al., 2013; Tiso et al., 2009; Yamaoka and Itakura, 1999) and because β-cell functionality can be observed in its transparent, externally developing embryos (Huang et al., 2001). We generated transgenic (Tg) (ins:Rcamp1.07) zebrafish, in which every β-cell was labeled with Rcamp1.07 (a red fluorescent Ca2+ indicator) and used a homemade high-resolution, two-photon, three-axis, digital scanning light-sheet microscope (2P3A-DSLM) to visualize for the first time the glucose-stimulated Ca2+ responses of individual β-cells in vivo. We revealed that a gradually increased glucose concentration, delivered through local diffusion or islet microcirculation, finely triggered the embryonic β-cells to acquire and enhance their function by activating the calcineurin/nuclear factor of activated T-cells (NFAT) signaling. We further demonstrated that this mechanism was conserved in neonatal mouse β-cell maturation ex vivo, which may promote the functional acquisition and optimal maturity of stem cell-derived β-like cells cultured in vitro. Finally, the variable functions of neonatal mouse islets cultured under different concentrations of glucose speaks for the importance of being able to image β-cell function in vivo, and this technology can be used to study other mechanisms in islet biology, including transdifferentiation, dedifferentiation and regeneration. To visualize β-cell function in vivo, we created a transgenic zebrafish line, Tg (ins:Rcamp1.07), in which the red fluorescent calcium indicator Rcamp1.07 (Ohkura et al., 2012) is expressed under the control of the insulin promoter. We demonstrated that Rcamp1.07 was exclusively expressed in β-cells, as confirmed by the cellular co-localization of Rcamp1.07 with EGFP in Tg (ins:Rcamp1.07);Tg (ins:EGFP) double transgenic fish (Huang et al., 2001) (Figure 1—figure supplement 1A–F) and with immunofluorescently labeled insulin in Tg (ins:Rcamp1.07) fish (Figure 1—figure supplement 1G–J). As Rcamp1.07 exhibited a very bright basal fluorescence at basal calcium concentrations, all β-cells within the islet were lighted up and readily detectable even in the absence of glucose stimulation (Figure 1—figure supplement 1C–F). 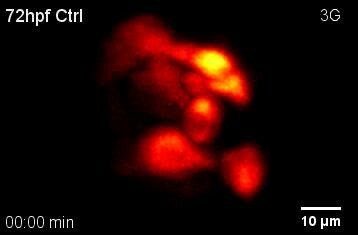 We then attempted to record the glucose-induced fluorescent intensity change in Rcamp1.07 in a live Tg (ins:Rcamp1.07) embryo at 72 hpf, at which stage zebrafish islets have been suggested to regulate glucose (Jurczyk et al., 2011). To stimulate β-cells in vivo, glucose was added to the E3 medium to a final concentration of 20 mM to incubate the Tg (ins:Rcamp1.07) fish embryos. Within 3 min of stimulation, we observed a robust transient increase in the fluorescence intensity of Rcamp1.07, which indicates glucose-stimulated Ca2+ influx in vivo, under a spinning-disc confocal microscope (Figure 1—figure supplement 2). However, individual β-cells were difficult to discern under either the confocal microscope or a single-photon selective-plane illuminative microscope (1P-SPIM) (Figure 1—figure supplement 3 and Video 1). 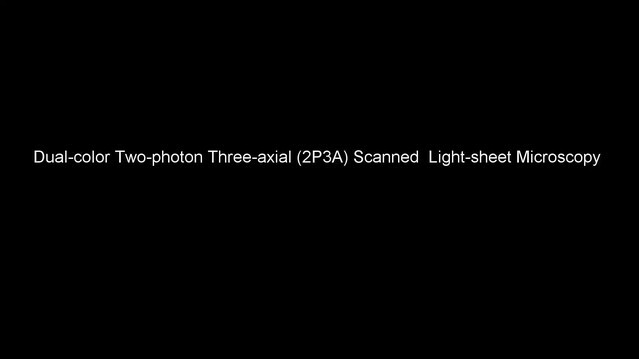 Using a two-photon microscope (TPM), we resolved individual β-cells in the XY plane, but the cell boundaries along the Z-axis were blurred because of a low axial resolution and a high scattering of the illumination light in deep tissues (Figure 1—figure supplement 3 and Video 1). Previously, based on 2P-DSLM and the tunable acoustic grin device (Dean and Fiolka, 2014; Duocastella et al., 2012; Duocastella et al., 2014; Olivier et al., 2009; Truong et al., 2011), we have developed a 2P3A-DSLM (Zong et al., 2015). Using this homemade system, we were able to reconstruct a clear three-dimensional (3D) structure of the islet in live fish embryos (Figure 1A–B and Videos 1–3). Visualization and characterization of β-cell functional development in vivo using 2P3A-DSLM. (A) An abbreviated scheme of the dual-color 2P3A-DSLM imaging system. (B) 3D-projection of all pancreatic β-cells in a live Tg (ins:Rcamp1.07) zebrafish embryo at 72 hpf. The different colors in the color bar represent different depths in the islet. (C) Quantification of glucose-responsive and glucose-nonresponsive β-cells at different stages from 24 to 72 hpf in live Tg (ins:Rcamp1.07);Tg (ins:EGFP) embryos. n = 10–16 embryos per stage. *p<0.05. (D) An illustration of the glucose-responsive (red) and glucose-nonresponsive (green) β-cells in islets in live Tg (ins:Rcamp1.07) embryos at 48, 56 and 72 hpf. (E) Representative traces of glucose-triggered maximum Ca2+ transients at the indicated stages. Scale bar: 10 μm. See also Figure 1—figure supplements 1–4 and Videos 1–3. A schematic illuminating the dual-color 2P3A-DSLM and comparison of image qualities among 1P-SPIM, TPM and 2P3A-DSLM in islet 3D imaging of live zebrafish. 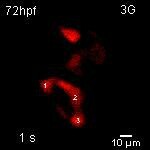 Representative time-lapse images of glucose-induced synchronized calcium transients in neighboring β-cells in a live Tg (ins:Rcamp1.07) embryo at 72 hpf under 2P3A-DSLM. Representative time-lapse volumetric reconstruction of glucose-stimulated calcium transients in all β-cells in a live Tg (ins:Rcamp1.07) embryo at 72 hpf under 2P3A-DSLM. Under 2P3A-DSLM, glucose-responsive β-cells first appeared at 48 hpf in vivo, 24 hr earlier than reported previously (Jurczyk et al., 2011; Singh et al., 2017). Next, we quantified insulin-positive cells and glucose-responsive β-cells in Tg (ins:Rcamp1.07);Tg (ins:EGFP) fish embryos at different stages. Interestingly, we identified a progressive increase in glucose-responsive β-cells (from 1.56 ± 0.27 to 11.38 ± 0.49) during the hatching period (48–72 hpf) following an increase in the number of total β-cells (from 14.5 ± 1.45 to 21.88 ± 0.95) during 36–48 hpf (Figure 1C and Figure 1—figure supplement 4A). We then focused on the hatching period to study the mechanisms by which the embryonic β-cells acquire their function. We used the maximal amplitude (Max ΔF/F0) of glucose-stimulated Ca2+ transients that is a key parameter of β-cell function (Bruin et al., 2015; Rezania et al., 2014), as the criteria to evaluate the functional status of individual β-cells in vivo (Figure 1—figure supplement 4B). Compared with the glucose-responsive β-cells appeared at 48 hpf, β-cells at 56 hpf exhibited larger average Ca2+ responses (Max ΔF/F0: 93.1% ± 9.7% versus 53.4% ± 8.9%) upon glucose stimulation. These average responses were further enhanced at 72 hpf, at which point β-cells responded with an approximately 150% maximal amplitude of the evoked Ca2+ transients (Figure 1D–E and Figure 1—figure supplement 4C). The histogram of maximal amplitudes of calcium transients from glucose-responsive β-cells shifts right gradually from 48 to 72 hpf, indicating that the increase in calcium signaling of β-cells from 56 to 72 hpf was from the same cells with increased activity (Figure 1—figure supplement 4C). Moreover, some neighboring β-cells showed synchronized Ca2+ responses in response to glucose (Figure 1—figure supplement 4D–E and Video 2). Therefore, we witnessed a gradual development of β-cell functionality in vivo from 48 to 72 hpf in zebrafish. Interestingly, by analysing 3D reconstructed images of the Tg (ins:Rcamp1.07) zebrafish islets at different stages, we found that β-cells acquired glucose responsiveness sequentially from the mantle to the core of the islet (Figure 1D, Figure 2A and Figure 2—figure supplement 1). From 48–60 hpf, β-cells in the mantle initiated and enhanced their functionality earlier than those in the core and exhibited a higher level of glucose responsiveness (Figure 2B) and higher maximum Ca2+ transients (Figure 2C). From 60 to 72 hpf, β-cells in the core started to initiate and accelerate their functional development. At 72 hpf, β-cells in the mantle and core were indistinguishable in all related parameters (Figure 2B–C). These results indicate β-cell functional heterogeneity from islet mantle to the core during the hatching period. Sequential functional acquisition of β-cells from the mantle to the core of the islet was coordinated by islet microcirculation. (A) A schematic illustrating the classification of β-cells into two populations: the cells in the outside (mantle, blue) and the cells in the inside (core, red) of the islet. (B) Time-dependent increases in the number of glucose-responsive β-cells in the mantle (dark) and core (red) of the islet. n = 12–16 embryos per stage. (C) Time-dependent increases in the maximum amplitude of the glucose-triggered Ca2+ transients in β-cells from the mantle and the core of the islet. n = 12–16 embryos per stage. (D) Representative 3D-projections of the β-cells (red) and blood vessels (green) in live wild type or cloche-/- Tg (ins:Rcamp1.07);Tg (flk1:GFP) embryos. (E) The experimental design for 2,3-BDM treatment used in (F). (F) The number of glucose-responsive β-cells (top) and their maximal Ca2+ responses to glucose (bottom) in the mantle and the core of the islets in cloche-/- mutants and 2,3-BDM-treated embryos. n = 4–6 embryos per stage. *p<0.05, **p<0.01; ns, not significant. Scale bars: 10 μm; scale bars apply to (A) and (D). See also Figure 2—figure supplements 1–3 and Video 4. To identify the potential mechanisms underlying the temporal and spatial heterogeneity of β-cell functional development, we visualized β-cells and their adjacent vessels in double transgenic zebrafish Tg (ins:EGFP);Tg (flk1:mCherry) or Tg (ins:Rcamp1.07);Tg (flk1:GFP), in both of which β-cells and vascular endothelial cells were labeled (Wang et al., 2013). We found that blood vessels initiated contacts with the islet mantle from 48 to 60 hpf and further penetrated into the inner layers of the islet from 60 to 72 hpf (Figure 2—figure supplement 2A–B and Video 4). Most of the glucose-responsive β-cells were located proximal to blood vessels (Figure 2—figure supplement 2C–E), and their longitudinal increase was paralleled by an increase in the number of β-cells located adjacent to the vessels (Figure 2—figure supplement 2F). These results indicate that β-cell functional development temporally and spatially correlates with islet vascularization. Volumetric reconstruction of pancreatic β-cells and their nearby blood vessels in live Tg (ins:EGFP);Tg (flk1:mCherry) embryos from 36 to 72 hpf. To explore whether the heterogeneous development of β-cell function is caused by islet vascularization, we examined β-cell function in the Tg (ins:Rcamp1.07); cloche-/- mutant embryos that have a normal number of β-cells but no vascular endothelial cells or blood cells (Figure 2D) (Field et al., 2003). At 56 hpf, glucose-responsive β-cells in cloche-/- embryos were indistinguishable from those in age-matched controls (Figure 2F). In contrast, at 72 hpf, cloche-/- mutants contained fewer glucose-responsive β-cells in the islet core (1.28 ± 0.47 versus 5.51 ± 0.43) and exhibited smaller maximum Ca2+ transients in glucose-responsive β-cells (Max ΔF/F0: 59.4% ± 7.8% versus 145.6% ± 8.3%) than the controls (Figure 2F). To exclude the possibility that the phenotypes observed above was because β-cells in the islet core did not have access to the glucose stimulation, we incubated embryos with supra-physiological dose of 2-(N-(7-nitrobenz-2-oxa-1,3-diazol-4-yl)Amino)−2-deoxyglucose (2-NBDG, 20 mM) to visualize this fluorescent deoxyglucose analog penetration in the fish embryos. The 2-NBDG (20 mM) efficiently penetrated into the whole islets within 5 min in 56 hpf and 72 hpf cloche-/- mutants even in the absence of blood circulation (Figure 2—figure supplement 3A), indicating that acutely applied high glucose is able to reach all β-cells within the islet independent of islet circulation. Thus, the defective function of β-cells in the islet core of 72 hpf cloche-/- mutants is due to an arrested maturity of these cells rather than a limited access to high glucose. Next, we transiently stopped circulation using 2,3-butanedione monoxime (2,3-BDM) (Bartman et al., 2004) in wild-type fish for a 9 hr treatment either from 44 to 53 hpf or from 60 to 69 hpf and evaluated β-cell function under 20 mM glucose stimulation at 56 hpf and 72 hpf respectively (Figure 2E–F). Although blood circulation was completely recovered during functional evaluation, the blockade of circulation from 60 to 69 hpf significantly impaired β-cell maturity in the islet core (glucose-responsive β-cell number: 1.75 ± 0.29 versus 5.51 ± 0.43 (control)); Max ΔF/F0: 73.1% ± 9.9% versus 145.6% ± 8.3% (control)) to an extent similar to that observed in cloche-/- mutants at the same age (Figure 2F). Therefore, blood circulation, but not the vascular endothelial cells per se, provides a key inductive signal for the initiation and enhancement of β-cell function in the islet core. On the other hand, given that the blockade of circulation from 44 to 53 hpf did not affect β-cells in the islet mantle to acquire glucose responsiveness (Figure 2F), blood circulation is not required for the initiation of β-cell functional acquisition in the islet mantle. Nevertheless, we could not exclude the possibility that β-cell functional maturation may cause these cells to secrete factors that promote angiogenesis, or completely eliminate the possible involvement of vascular endothelial cells in β-cell functional development. Glucose has been reported to regulate embryonic pancreatic endocrine cell differentiation (Guillemain et al., 2007). Thus, we investigated whether this major nutrient in the circulatory system also plays a role in the functional development of β-cells. We used 3-mercaptopicolinic acid (3 MPA), an inhibitor of gluconeogenic phosphoenolpyruvate carboxykinase 1 (pck1), to suppress endogenous glucose synthesis (Jurczyk et al., 2011) for 9 hr from 44 to 53 hpf or from 60 to 69 hpf. This treatment severely inhibited β-cell function in the mantle and the core of the islet under both conditions (Figure 3 and Video 5). Therefore, endogenous glucose is essential for the development of β-cell function in the mantle and the core of the islet. Because yolk syncytial layers, located very close to the islet, already express pck1 before islet vascularization (Jurczyk et al., 2011), locally synthesized glucose may diffuse to the islet mantle to initiate the function of peripheral β-cells in the islet. However, β-cells in the islet core started to acquire function only after the establishment of intra-islet vascularization, indicating that the delivery of inductive concentrations of glucose to β-cells in the islet core may require blood circulation. Indeed, a physiological dose of 2-NBDG (8 mM) did not efficiently reach the islet core at 56 hpf when islet circulation has not been established completely, but fully penetrated into the whole islet at 72 hpf with islet vascularization (Figure 2—figure supplement 3B). These data are in direct contrast to the penetration of supra-physiological dose of 2-NBDG (20 mM) (Figure 2—figure supplement 3A) and clearly indicate the role of islet vascularization in delivering a physiological dose of glucose to β-cells within the whole islet. Optimal glucose concentrations were required to induce heterogeneous and optimal β-cell functionality at different developmental stages. (A–B) Numbers of glucose-responsive β-cells (A) and their maximal Ca2+ responses to glucose (B) in the mantle and the core of the islets from embryos treated with 3 MPA and different concentrations of glucose. n = 4–8 embryos per condition in (A) and (B). *p<0.05, **p<0.01. (C–D) Recovery ratios of glucose-responsive β-cells (C) and their maximal Ca2+ responses to glucose (D) following treatment with different concentrations of exogenous glucose in the presence of 3 MPA to inhibit endogenous glucose production. The ratios are presented as the normalized numbers of glucose-responsive β-cells or the normalized maximal amplitudes of the calcium transients compared with those in the control embryos. n = 4–8 embryos per condition in (C) and (D). *p<0.05, **p<0.01; ns, not significant. See also Video 5. Representative time-lapse volumetric reconstruction of glucose-stimulated calcium transients in all β-cells in a live Tg (ins:Rcamp1.07) embryo at 72 hpf that had been treated with 3 MPA for 9 hr under 2P3A-DSLM. To explore the optimal glucose concentration for the induction, we incubated zebrafish embryos with a combination of 3 MPA and different concentrations of glucose (3 mM, 5 mM, 8 mM or 20 mM) for 9 hr (Figure 3). Treatment with 3 mM or 5 mM glucose from 44 to 53 hpf completely rescued the β-cell functional defects caused by 3 MPA, whereas 8 mM glucose partially restored the number of glucose-responsive β-cells in the islet mantle (Figure 3). In contrast, treatment with 8 mM glucose from 60 to 69 hpf completely rescued the phenotype, while 3 mM or 5 mM glucose was insufficient to maintain a normal functional β-cell mass in the islet core (Figure 3). In both cases, 20 mM glucose exhibited the worst performance in the rescue experiments, indicating the glucotoxicity of this high concentration under long-term exposure, which has been reported for mammalian β-cells (Poitout et al., 2006). However, it is interesting that glucotoxicity in fish embryo caused by chronic incubation of 20 mM is less severe than expected, suggesting that living organism may have some buffering mechanisms to antagonize the glucotoxicity of 20 mM glucose to β-cells. Collectively, glucose triggers the initiation and enhancement of β-cell functionality in both the core and the mantle of the islet. Moreover, the inductive concentration of glucose is gradually increased with time and mediates the heterogeneous development of β-cell functionality in vivo. The activation of calcineurin/NFAT by a glucokinase activator was proposed to mediate β-cell development and function in mice (Goodyer et al., 2012; Heit et al., 2006). Calcineurin is a calcium- and calmodulin-dependent serine/threonine protein phosphatase that activates cytoplasmic NFAT by dephosphorylating it. The activated NFAT is then translocated into the nucleus to regulate downstream gene transcription. To investigate whether calcineurin/NFAT is the signaling pathway downstream of glucose that controls the functional development of β-cells in vivo, we examined β-cell function after preincubating embryos with calcineurin/NFAT inhibitors or activators. Inhibition of calcineurin with FK506 (Goodyer et al., 2012; Heit, 2007) for 9 hr from 36 to 45 hpf prevented the appearance of glucose-responsive β-cells at 48 hpf without affecting the total β-cell number (Figure 4A and Figure 4—figure supplement 1A). Inhibition of calcineurin with FK506 or NFAT with VIVIT (Demozay et al., 2011) from 44 to 53 hpf or from 60 to 69 hpf significantly reduced the number of glucose-responsive β-cells and their maximal Ca2+ transient amplitude at 56 hpf and 72 hpf (Figure 4B–C and Figure 4—figure supplement 1B–C). On the other hand, activation of calcineurin with CGA or NFAT with ProINDY (Ogawa et al., 2010) for 9 hr rescued the defective function of β-cells caused by 3 MPA, 2,3-BDM or the cloche-/- mutants (Figure 4B–C, Figure 4—figure supplement 1B–C and Video 6). These results suggest that calcineurin/NFAT mediates the role of glucose on triggering β-cell functional development. Calcineurin/NFAT signaling acted as the downstream of glucose to initiate and enhance β-cell functionality. (A) Numbers of glucose-responsive β-cells in 48 hpf embryos that had been treated with the indicated reagents. n = 4–8 embryos per condition. *p<0.05, **p<0.01. (B) Numbers of glucose-responsive β-cells in the mantle and the core of the islet in 56 hpf embryos that had been treated with the indicated reagents. n = 5–9 embryos per condition. *p<0.05, **p<0.01. (C) Numbers of glucose-responsive β-cells in the mantle and the core of the islet in 72 hpf embryos that had been treated with the indicated reagents. n = 5–9 embryos per condition. **p<0.01. (D) Representative two-photon images of Rcamp1.07 (left), EGFP (middle) and the merged image (right) of the islet cells in a living Tg (ins:Rcamp1.07);Tg (ins:EGFP-GSG-T2A-dn-zCnA) embryo. (E) Numbers of glucose-responsive β-cells in age-matched controls and dn-zCnA-expressing embryos at 48 hpf, 72 hpf and seven dpf. n = 4–6 embryos per stage. **p<0.01, ***p<0.001; ns, not significant. Scale bar: 10 μm. See also Figure 4—figure supplements 1–2 and Videos 5–6. Representative time-lapse volumetric reconstruction of glucose-stimulated calcium transients in all β-cells in a live Tg (ins:Rcamp1.07) embryo at 72 hpf that had been co-treated with 3 MPA and CGA for 9 hr under 2P3A-DSLM. To exclude the possible off-target effects of the pharmacological reagents, we did a control experiment by testing the effects of the pharmacological reagents (10 mM BDM, 3 mM 3 MPA, 10 μM FK506 and 141.2 μM CGA) on calcium activities of neurons in the central nervous system (CNS) using Tg (elavl3:Gcamp6s) zebrafish in which neurons are labeled by the calcium indicator Gcamp6s (Dunn et al., 2016). The result showed that the calcium levels of the CNS neurons were not affected by any of the pharmacological reagents, indicating that the pharmacological treatment in our study specifically affected β-cells (Figure 4—figure supplement 2). 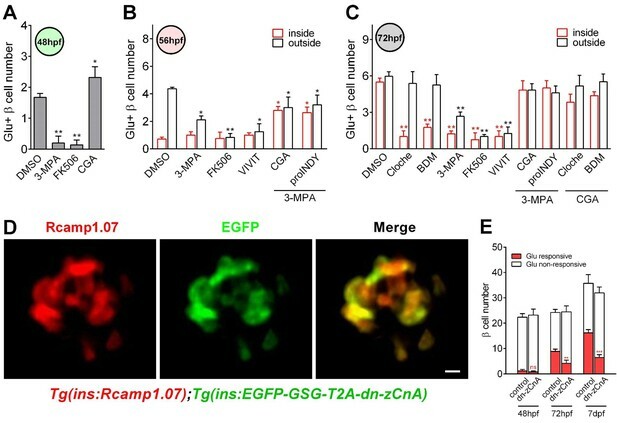 In addition, we designed a dominant-negative zebrafish calcineurin A (dn-zCnA) using a similar strategy described previously (Faure et al., 2007) and generated transient Tg (ins:EGFP-GSG-T2A-dn-zCnA) zebrafish embryos on the Tg (ins:Rcamp1.07) genetic background. In these embryos, dn-zCnA is co-expressed with EGFP through a GSG-T2A linker under the control of the insulin promoter. In total, 75.8% ± 2.5% of Rcamp1.07-positive cells co-expressed EGFP, indicating that 70%–80% of β-cells expressed dn-zCnA in Tg (ins:Rcamp1.07);Tg (ins:EGFP-GSG-T2A-dnCnA) double transgenic zebrafish (Figure 4D). However, in these embryos glucose-responsive β-cells appearing at 48 hpf were all EGFP negative, and their number was similar with that in the age-matched controls (Figure 4E). In contrast, the number of glucose-responsive β-cells (70%–80% expressing dn-zCnA) was reduced (4.13 ± 1.28 versus 8.87 ± 0.88 (control)) and the maximum Ca2+ transients were lower in embryos expressing dn-zCnA at 72 hpf than in age-matched controls (78.7% ± 6.9% versus 112.3% ± 10.3%) (Figure 4E), suggesting that genetic perturbation of calcineurin/NFAT signaling prevents the glucose-responsiveness of β-cells. To rule out the possibility of the non-specific effects slowing the appearance of markers in the cells, we examined the numbers of glucose-responsive β-cells and their maximal calcium responses to glucose in late (seven dpf) embryos. 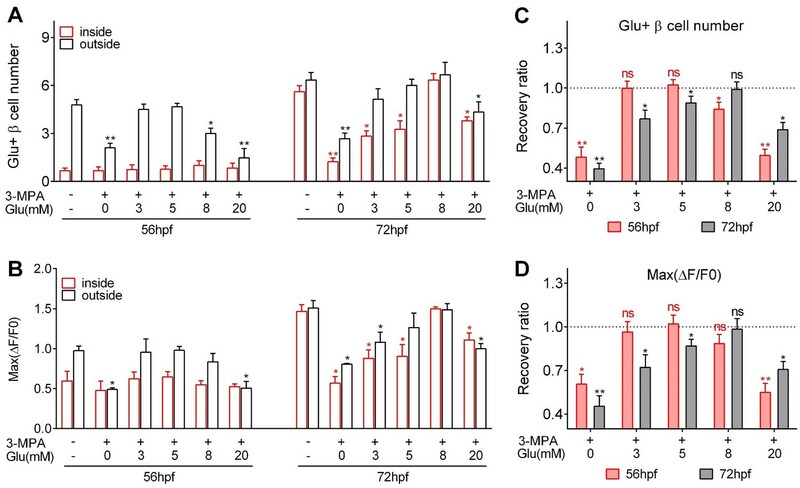 From 72 to 7 dpf, the glucose-responsiveness of β-cells in dn-zCnA zebrafish did not catch up but were still much less than that in 72 hpf control (Figure 4E). Therefore, all of these results demonstrate that calcineurin/NFAT signaling, downstream of glucose, is critical for β-cell functional development. To explore the effect of calcineurin/NFAT signaling in β-cell functional development in mammals, we isolated neonatal islets from postnatal day 0 (P0) mice and cultured them for 3 days in media supplemented with different concentrations of glucose in the presence or absence of CGA. Then, we measured insulin secretion sequentially in response to either low (3 mM) or high (20 mM) glucose stimulation. When islets had been cultured in medium with 5.6 mM or 7 mM glucose, in the presence or absence of CGA, neonatal islets secreted significantly more insulin than adult islets under 3 mM glucose stimulation (Figure 5A), which agreed with previous results that the neonatal β-cells are more sensitive to low glucose (Blum et al., 2012). For neonatal β-cells cultured in medium with 11 mM glucose, their insulin secretion at low glucose dropped to a level similar to that of adult β-cells (Figure 5A). This finding indicates that optimal glucose may trigger β-cell maturation by reducing their sensitivity to low glucose through a calcineurin/NFAT-independent pathway. On the other hand, no matter what glucose concentration was used in the culture medium, neonatal islets cultured in vitro secreted substantially less insulin than adult islets under 20 mM glucose stimulation. 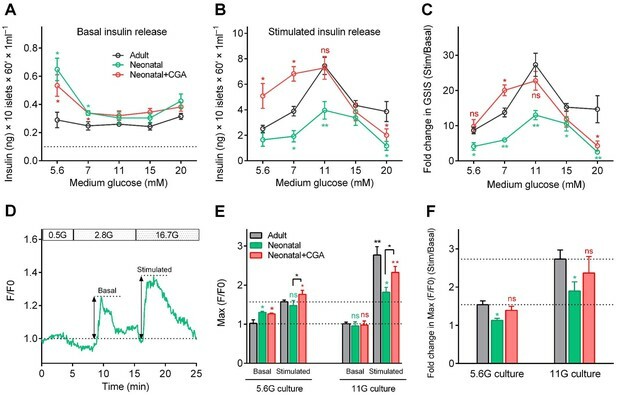 However, supplementing CGA in the culture medium of 11 mM glucose increased the high-glucose-stimulated insulin secretion of the neonatal β-cells (7.29 ± 0.86 ng/ml; Glucose Stimulation Index (GSI) = 22.74 ± 2.68) to a level similar to that of adult β-cells (7.44 ± 0.53 ng/ml; GSI = 27.29 ± 3.29) (Figure 5B–C). Taken together, our results demonstrate that optimal glucose could trigger neonatal β-cells functional maturation by reducing low-glucose-induced insulin secretion and increasing high-glucose-stimulated insulin secretion, and the latter mechanism is through the activation of calcineurin/NFAT (Figure 5A–C). Direct activation of calcineurin promoted the optimal maturity of neonatal mouse β-cells in isolated islets in vitro. (A–B) Glucose-induced insulin secretion from neonatal and adult mouse islets sequentially stimulated with 3 mM glucose (A) and 20 mM glucose (B) after isolation from P0 and 8-week-old mice, and for 3 days of culture in different types of media (different concentrations of glucose combined with or without CGA) in vitro. The black dotted line in A indicates the value of the ELISA kit detection limit. n = 4–10 experiments per condition. *p<0.05, **p<0.01; ns, not significant. (C) Glucose Stimulation Index (fold change in GSIS) of the mouse islets described in (A) and B). n = 4–10 experiments per condition. *p<0.05, **p<0.01; ns, not significant. (D) An illustration of the maximum amplitude of calcium influx in islets under 2.8 mM and 16.7 mM glucose stimulation. (E) Quantification of maximal amplitude of glucose-induced calcium influx in islets under different culture conditions. n = 4–7 islets per condition. *p<0.05, **p<0.01; ns, not significant. (F) Fold change in maximal amplitude of glucose-induced calcium influx in islets under stimulation and resting conditions described in (E). n = 4–7 islets per condition. *p<0.05; ns, not significant. See also Figure 5—figure supplement 1. Finally, we used mouse islets cultured in vitro to evaluate the correlation between glucose-stimulated calcium transients and GSIS. Compared with adult islets, neonatal islets cultured in medium with 5.6 mM glucose also exhibited a significantly higher ensemble of calcium transients under 2.8 mM glucose (130.3% ± 2.3% versus 102.2% ± 7.1%); these calcium transients were abolished if the neonatal islets were cultured in 11 mM glucose (95.7% ± 10.3% versus 101.2% ± 4.3%), and the neonatal islets became indistinguishable from those of adult islets (Figure 5D–E and Figure 5—figure supplement 1). Moreover, although including CGA in the culture medium did not reduce low-glucose-triggered calcium transients in neonatal islets cultured in 5.6 mM glucose (126.4% ± 1.9% versus 130.3% ± 2.3%), it did enhance the maximal amplitude of calcium transients triggered by 16.7 mM glucose in neonatal islets cultured both in 5.6 mM glucose (176.4% ± 8.4% versus 147.5% ± 10.2%) and 11 mM glucose (232.2% ± 12.5% versus 181.7% ± 9.5%) (Figure 5D–F and Figure 5—figure supplement 1). Therefore, glucose-induced calcium response is a reliable and sensitive marker of β-cell functional status. Visualizing the function of every β-cell in vivo has always been the holy grail for β-cell researchers (Gotthardt et al., 2014). Unlike in vivo imaging of β-cells in mammalian species with conventional positron emission tomography and single-photon emission computed tomography that only provide poor spatial-temporal resolution, transparent zebrafish constitutes a unique model that allows high-resolution fluorescent imaging in vivo. In addition to this competitive advantage, we applied the high-resolution 2P3A-DSLM, which has been shown to outperform other microscopes, including the point-scanning TPM, in differentiating individual β-cells in live fish embryos (Video 1). With these tools, we achieved the first imaging of individual β-cell function in vivo. We further revealed a heterogeneous functional development of β-cells in vivo and identified its underlying mechanism, that is, islet vascularization regulates glucose delivery to control the heterogeneous functional development of β-cells. Interestingly, there was an increase in optimal glucose concentrations for inducing and enhancing β-cell function from the early to the late hatching period, while a suboptimal or supra-physiological concentration of glucose impaired β-cell functional development (Figure 3). Therefore, the precise delivery of the optimal inductive glucose concentrations via blood circulation is critical for the normal development of β-cell function in vivo. An increase in glucose concentration to induce the functional development of β-cells at different stages is likely to be a conserved mechanism in mammals. For example, the plasma glucose level in fetal rodents is relatively low but starts to increase immediately before birth and progressively reaches a plateau (above 4 mM) after P2 (Rozzo et al., 2009). From P6 to P20, the plasma glucose level further gradually increases from 6 to 12 mM (Aguayo-Mazzucato et al., 2006). This period is accompanied by islet vascularization, the appearance of glucose-responsive β-cells and further maturation (Hole et al., 1988; Reinert et al., 2014; Rozzo et al., 2009). On the other hand, inappropriately elevated blood glucose levels impaired the β-cell maturation process, as we observed in zebrafish (Figure 3). Maternal diabetes in rats leads to immature β-cells in new-borns (Eriksson and Swenne, 1982). In human, offspring of type two diabetic women have a higher prevalence of type two diabetes than the offspring of nondiabetic women (Pettitt et al., 1988). Therefore, glucose, in addition to being the substrate for adult β-cells, also acts as the critical signaling molecule to induce immature β-cells to become more capable of metabolizing glucose and secreting insulin. This mechanism may represent a general principle that applies to the functional development of other cells. A previous study from mice indicates that β-cell functional maturation is marked by an increase in the glucose threshold for insulin secretion. However, the mechanisms underlying the increase in the glucose threshold for insulin secretion are not known. Here, through in vivo study in zebrafish and ex vivo study using neonatal mouse islets, we demonstrated that calcineurin/NFAT mediates the inductive roles of glucose, enhancing high-glucose-stimulated insulin secretion during maturation; however, the reduction in low-glucose-stimulated insulin secretion is mediated by a glucose-activated calcineurin/NFAT-independent pathway during neonatal mouse islet maturation. Multiple glucose-activated signaling pathways are potential ‘switches’ that enhance the glucose metabolism machinery during the development of β-cell function (Eriksson and Swenne, 1982; Lawrence et al., 2002; Vanderford et al., 2007; Vaulont et al., 2000; Zhang et al., 2015). These pathways may also involve enhancing high-glucose-stimulated insulin secretion. However, which pathway mediates the optimal glucose-induced reduction in low-glucose-stimulated insulin secretion awaits further investigation. Nevertheless, the combined application of a calcineurin activator and optimal glucose overcame the microcirculation deficit in isolated mouse islets and accelerated the ex vivo functional development of neonatal mouse β-cells (Figure 5). Similar to isolated mouse islets, stem cell-derived islet-like clusters also lack blood circulation. Different research groups have used a variety of glucose concentrations, ranging from 2.8 to 20 mM, in the final stage of differentiation (Pagliuca et al., 2014; Rezania et al., 2014; Russ et al., 2015); these glucose concentrations may be suboptimal. However, the lack of glucose delivery to all β-like cells within the clusters due to the absence of blood circulation may still be the critical missing factor for promoting high-glucose-stimulated insulin secretion of these cells, even at an optimal glucose concentration, such as 11 mM. Based on our results, the use of a calcineurin activator may overcome this problem and improve the functionality of stem cell-derived β-like cells in clusters. Although the calcineurin/NFAT signaling pathway has been implicated in β-cell development and maturation in mice (Goodyer et al., 2012; Heit et al., 2006), this pathway has never been manipulated directly in the trials of in vitro differentiation of stem cells into functionally mature β-cells. Our study offers a new strategy of using a calcineurin activator combined with an optimal glucose concentration to promote the functional maturity of stem cell-derived β-like cells within these islet-like clusters in vitro. Our study also provides a new direction for using in vivo imaging of β-cell mass and function to study mechanisms of islet biology such as regeneration, cell identity or functional changes during disease progression. An understanding of these principals may shed light on methods for developing cell replacement therapies to treat diabetes. Forward primer: 5’ ATGTTTTTGATTGACAGAGATTGTATGTGTGTGTTTGTGTCAGTGTGACC CGCCACCATGGGTTCTCATC. Reverse primer: 5’ CCTGTGTGCAAACAGGTGTTTCTGGCATCGGCGGTGGTCAAATCTCTTCA GGCAGATCGTCAGTCAG. Forward primer: 5’ AGTCCATTAAATAATATCTTGTAGAATTATGTTTTTAAAAAGTACCAATGCC GTAGGGATAACAGGGTAATTTAAGC. Reverse primer: 5’ CAACTTTTTCACAAACACTGACCAAAACAAGCTACATGTTTTAGAGGCATTA GGGATAACAGGGTAATTGCACTG. The resulting constructs were co-injected with I-SceI meganuclease (Roche, Indianapolis, IN) at a DNA concentration of 100 ng/μl into one-cell stage zebrafish embryos. These F0 embryos were screened for the transient expression of Rcamp1.07 in the pancreatic islet at 48 hpf using a fluorescence stereomicroscope. The positive F0 founders were raised to adulthood and screened by visual inspection of their F1 progenies from outcrossing with the wild-type AB strain. Based on the intensity of the fluorescence signal, one founder was selected, and subsequent generations were propagated and expanded. The Tg (ins:EGFP-GSG-T2A-dn-zCnA) zebrafish line was generated using Tol2 transposase RNA-mediated transgenesis as previously described (Kawakami, 2007). Briefly, dn-zCnA was constructed by deleting the autoinhibitory and the calmodulin-binding domains through introducing a stop codon at the N396 amino acid and by mutating the histidine at the position 152, a phosphatase-active site, to glutamine (Zou et al., 2001). The GSG-T2A peptide was used to separate EGFP and dn-zCnA elements. The EGFP-GSG-T2A-dn-zCnA fragment was cloned downstream of 2.1 kb of the proximal insulin promoter and into a Tol2 plasmid using a ClonExpress system. The final construct was injected along with Tol2 transposase RNA into Tg (ins:Rcamp1.07) eggs to generate mosaic Tg(ins:EGFP-GSG-T2A-dn-zCnA);Tg (ins:Rcamp1.07) F0 fish for imaging analysis. The wild-type AB strain and transgenic fish were maintained and handled according to the institutional guidelines of animal usage and maintenance of Peking University. The Tg (ins:EGFP) fish were from Dr. Lin Shuo at UCLA; the Tg (flk1:mCherry) fish were from Dr. Zhang Bo at PKU; the Tg (flk1:GFP) fish were from Dr. Chen Jau-Nian at UCLA and the Tg (elavl3:Gcamp6s) fish were from Dr. Florian Engert at Harvard University. Tg (ins:Rcamp1.07) was crossed with heterozygous cloche-/+ to obtain Tg (ins:Rcamp1.07);cloche-/+ zebrafish. Tg (ins:Rcamp1.07);cloche-/- embryos from the crossing of Tg (ins:Rcamp1.07);cloche-/+ with cloche-/+ fish were used for the imaging experiments. Phenylthiourea (0.002%) (PTU, Sigma, St. Louis, MO) was added at 12 hpf to prevent pigment synthesis. Prior to live imaging experiments, embryos were anesthetized with 0.01% tricaine (Sigma). Heterozygous Tg (ins:Rcamp1.07) embryos were used for pharmacological treatments and imaging analyses. All chemicals were prepared as high-concentration stocks and diluted in E3 medium to the final concentrations used for treatment, which were carefully selected to be nontoxic and effective. Embryos were treated with each chemical for 9 hr, either from 36 to 45 hpf, 44–53 hpf or from 60 to 69 hpf, followed by a 3 hr recovery after the chemicals were completely washed out with E3 medium to test the pharmacological effects of the chemicals on the functional development of pancreatic β-cells. Imaging analyses for functional evaluation were performed at 48 hpf, 56 hpf or 72 hpf. For the pharmacological treatment of zebrafish embryos, 10 mM 2,3-BDM (Sigma) was used to block blood circulation. 2,3-BDM is a well-characterized, low-affinity, noncompetitive inhibitor of skeletal muscle myosin-II that blocks myofibrillar ATPase in a dose-dependent manner. This compound decreases the myocardial force, thereby abolishing blood flow at the 10 mM concentration in our experiments (Bartman et al., 2004). Zebrafish embryos were treated with 3 mM 3 MPA (Santa Cruz Biotechnology, Dallas, Texas) to inhibit endogenous glucose production, 141.2 μM chlorogenic acid (CGA, Sigma) or 10 μM FK506 (Invivogen, San Diego, CA) to activate or inhibit calcineurin, respectively, and 2.5 μM ProINDY (Tocris, Minneapolis, MN) or 20 μM VIVIT peptide (Tocris) to activate or inhibit NFAT, respectively. 2-NBDG (Invitrogen, Waltham, MA) is a fluorescent deoxyglucose analog that can be taken up by the cells through glucose transporters. Fluorescence generated by 2-NBDG is therefore used to measure glucose uptake with a fluorescence microscope, as its intensity is proportional to glucose uptake by the cells (Yamada et al., 2007). 2-NBDG stock was diluted to working concentrations and then ready to be used for incubating live zebrafish embryos. After thoroughly washing, images were captured under a TPM (Zeiss 710). The 2-NBDG signal was excited at 920 nm and collected between 510 and 540 nm. For the confocal time-lapse imaging, images were captured using an Olympus spinning-disc confocal microscope with a 10×/0.4 objective and 1.6 × preamplifier. Tg (ins:Rcamp1.07) embryos were embedded in a 1% ultra-pure agarose (Invitrogen) cylinder and immersed in an imaging chamber filled with E3 medium containing 0.01% tricaine. A D-glucose stock solution was added to the E3 medium to a final concentration of 20 mM during stimulation. Time-lapse images were captured once per second with a 100 ms exposure time. Images were collected using MetaMorph software and analyzed with Fiji software. High-resolution images of pancreatic β-cells and blood vessels in live zebrafish embryos were captured with a 2P3A-DSLM equipped with two 40×/0.8 water lenses, as previously described (Zong et al., 2015). Briefly, anesthetized embryos were embedded in a 1% ultra-pure agarose cylinder and immersed in E3 medium containing 0.01% tricaine. 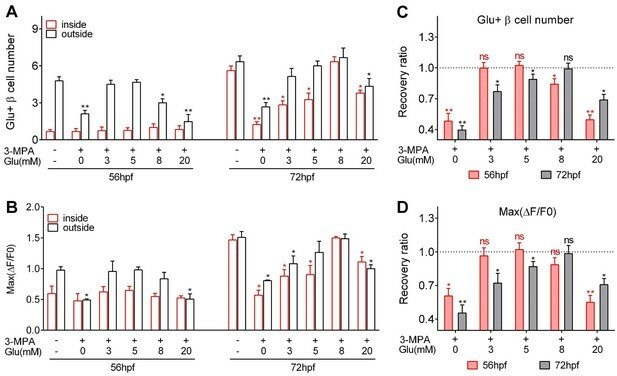 When monitoring β-cell function within zebrafish embryos, glucose was added to the E3 medium to a final concentration of 20 mM as an acute stimulation. For the 2D time-lapse imaging experiments used in the statistical analysis, the islet was optically sectioned into 5–6 layers to ensure that the calcium transients were recorded in all β-cells within the islet. For the fast volumetric imaging and reconstruction of calcium transients within the whole islet, the islet was optically sectioned into 25 layers. Each layer was captured five times with an 8 ms exposure time and was averaged as one single image. Images were collected using the HCImage software (Hamamatsu) and processed with R-L deconvolution by the Fiji software. The volumetric calcium transients were reconstructed using Amira software (FEI). For every β-cell, the relative change in the fluorescence intensity of Rcamp1.07 was indicated by the ΔF/F0. The ΔF value was calculated as the difference between the absolute intensity values (F) at any time point and the initial intensity value (F0) at the first time point. For 1P-SPIM imaging, we used a homemade SPIM setup equipped with a 40×/0.8 water lens. For TPM imaging, we used a fast resonant-scanned TPM equipped with a 40×/0.8 water lens. The same 72 hpf zebrafish samples were sequentially imaged with 1P-SPIM, TPM and 2P3A-DSLM. Under each configuration, the whole islet was optically sectioned by 100 planes (z-step: 500 nm) with an exposure time of 150 ms per frame. Images were captured using the HCImage software and processed with R-L deconvolution using Fiji software. The embryos were fixed in 4% paraformaldehyde (PFA, AppliChem, St. Louis, MO) at 4°C overnight. After washing, the embryos were dehydrated in 30% sucrose (Sigma) and then transferred to embedding chambers filled with OCT compound (Tissue Tek, Sakura Finetek, Torrance, CA). After embedding, the samples were frozen in liquid nitrogen as soon as possible. Sectioning was performed using a Leica CM1900 Cryostat set to a 10 μm thickness and a −25°C chamber temperature. The sections were collected and kept at −20°C in a sealed slide box. Each section was gently transferred to room temperature (RT) by allowing the section to melt onto the slide for at least 1 hr prior to immunostaining. Sections were washed once and then permeabilized with acetone for 5–10 min at RT. After extensively washing and blocking with PBST (PBS + 0.1% Tween-20) containing 0.2% bovine serum albumin (BSA, AppliChem) and 5% fetal bovine serum (Gibco, Gaithersburg, MD) for 1 hr at RT, the sections were incubated with primary antibodies overnight at 4°C. Then, secondary antibodies were applied at 4°C overnight after thorough washing. For nuclear staining, the sections were incubated with 2 μg/ml DAPI (Solarbio, Beijing, CN) for 10 min. After extensive washing, the sections were mounted in 80% glycerol (Sigma) and imaged under an Olympus spinning-disc confocal microscope. The primary antibodies included monoclonal rat anti-mCherry antibody (1:200, Thermo, Waltham, MA) used to detect Rcamp1.07 and polyclonal guinea pig anti-insulin antibody (1:200, Dako, Carpentaria, CA). The secondary antibodies included Alexa Fluor 568 goat anti-rat IgG (1:500, Thermo) and DyLight 488 goat anti-guinea pig IgG (1:500, Thermo). Adult islets from 8-week-old mice were isolated as previously described (Wang et al., 2016). For islet isolation from P0 mice, pancreata were directly dissected without perfusion and digested with 0.5 mg/ml Collagenase P (Roche). The isolated islets were cultured for 3 days in RPMI1640 media containing different concentrations of glucose (5.6 mM, 7 mM, 11 mM, 15 mM and 20 mM) with or without CGA (56.48 μM). The culture medium was changed daily. To measure GSIS, 10 islets of similar sizes were selected and preincubated in KRB buffer for 2 hr at 37°C in a 5% CO2 incubator. The islets were then transferred to low-glucose (3 mM) KRB buffer and incubated for 1 hr at 37°C, 5% CO2. The supernatant was collected, and basal insulin secretion was measured. The same islets were transferred to high-glucose (20 mM) KRB buffer for another 1 hr incubation at 37°C, 5% CO2. The supernatant was collected and stored at −20°C, and later, the insulin content was measured using the rat/mouse insulin ELISA kit (Millipore, St. Louis, MO). For ex vivo calcium imaging, the islets were washed with KRB buffer, incubated with 10 μM Cal-520 AM (AATB) for 60 min, washed twice with KRB buffer, and then incubated further at 37°C for another 15 min without the dye. Before imaging, islets were attached to chamber coated with Cell-Tak (Corning, NY, USA) and then immediately staged on spinning-disc confocal microscope for the acquisition of high-resolution images. Time-lapse images were captured once per second at a single-cell resolution of 40 × magnification. The progression of glucose challenges and the time of stimulation during imaging were as follows: 5 min in 0.5 mM glucose KRB buffer; 10 min in 2.8 mM glucose KRB buffer; and 10 min in 16.7 mM glucose KRB buffer. Images were analyzed using Fiji software. 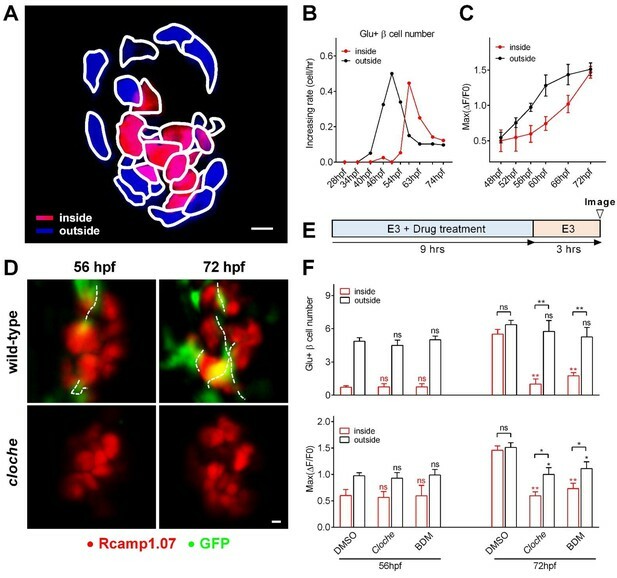 Based on both 2D images and 3D reconstructed images of Tg (ins:Rcamp1.07) zebrafish islets, all β-cells were manually outlined according to their localization (inside or outside, Figure 2A) or glucose responsiveness (responsive or nonresponsive, Figure 1D). The coordinate positions of the β-cells were added to the region of interest (ROI) manager in the Fiji software. Then, we loaded the raw data and the ROI information into our self-developed MATLAB program and transformed the grayscale map to hue-saturation value (HSV) color space, setting saturation to one and the proportionate value to the gray level distribution. The hue consists of 0, 120 and 240 representing three colors. As shown in Figure 2A and Figure 1D, the inside or glucose-responsive cells are red colored (hue = 0), and the outside or glucose nonresponsive cells are blue colored (hue = 240) or green colored (hue = 120). All data were analyzed using GraphPad Prism six software. The results are displayed as the mean value ±standard error of the mean (SEM). Unpaired Student’s two-tailed t-tests were used to compare data between two indicated groups. One-way ANOVA followed by Dunnett’s test was used for multiple comparisons with the control group. The asterisks *, ** and *** indicate significance with p values less than 0.05, 0.01 and 0.001, respectively. Animal care, generation of transgenic zebrafish lines, in vivo imaging of living zebrafish embryos and all other experiments involving zebrafish and mouse islets were approved by the IACUC of Peking University in China (reference number: IMM-ChenLY-2). Current Topics in Developmental Biology 106:217–238. Journal of Biomedical Optics 17:050505. Journal of Cell Science 120:3034–3044. Trends in Endocrinology & Metabolism 25:375–377. Journal of Biological Chemistry 282:15228–15237. American Journal of Physiology-Endocrinology and Metabolism 254:E167–E174. Molecular and Cellular Endocrinology 177:117–124. General and Comparative Endocrinology 170:334–345. Stem cells to insulin secreting cells: two steps forward and now a time to pause? The Journal of Nutrition 136:873–876. Annals of the New York Academy of Sciences 1152:53–62. Annual Review of Cell and Developmental Biology 29:81–105. Methods in Molecular Biology 546:117–130. Molecular and Cellular Endocrinology 312:24–30. Journal of Biological Chemistry 282:1577–1584. Journal of Biological Chemistry 275:31555–31558. Journal of Cell Science 129:2462–2471. International Journal of Molecular Medicine 3:247–261. Thank you for submitting your work entitled "In Vivo Imaging β-cell Function Reveals Two Waves of β-cell Maturation" for consideration by eLife. Your article has been reviewed by three peer reviewers, and the evaluation has been overseen by a Senior/Reviewing Editor. The reviewers have opted to remain anonymous. This manuscript describes experiments where β-cells within the developing zebrafish embryo are imaged using a two-photon light-sheet microscope. The stated rationale for doing so is the ability of monitoring β-cell activity in situ in a non-invasive manner. While these are technically demanding experiments, the spatial and temporal resolution of the image data is limited compared to what has been recently reported using more conventional microscopes in an ex vivo setting. The novel insight that is afforded by this technique and is therefore limited and while the choice for zebrafish as a model is transparent and well-justified, it inevitably raises questions regarding the degree of similarities between zebrafish and rodent β-cells including if β-cells in the zebrafish islet are coupled via gap junctions (the videos provided suggest not? ), what the glucose threshold is for a zebrafish β-cell (what is non-fasting plasma glucose in a zebrafish anyway). Also, the zebrafish islet in the paper is divided into a mantle and core, but with only 15-20 β-cells making up the islet, it is questionable if there truly is a mantle/core distinction such as the one that is readily apparent in rodent islets. The visualization of the vascularization of the islet during development is nice but would not have required a two-photon light-sheet setup. The major concern is that throughout the paper, β-cell maturation and function are conflated. This betrays a serious flaw in the premise of the work that pervades the entire paper. Transgenic zebrafish are used that express the Rcamp red calcium indicator in β-cells. These fish are exposed to glucose and an Rcamp response to glucose is interpreted to indicate functional maturity of the responding β-cells. Using this approach, the investigators observe calcium responses first on the outside of the islet followed by β-cells in the islet core and conclude from this that β-cells mature from mantle to core. The problem with this interpretation is that if β-cells at the core were mature but were not exposed to glucose, they would not respond with a calcium response. Indeed, the investigators then demonstrate the vascularization proceeds from the mantle to the core and suggests that the mantle β-cells respond first simply because they are exposed to the circulation earlier in development. The experiments where vascularization is perturbed chemically or via genetic perturbation predictably cause reduced β-cell functionality, but likely not because β-cell maturation is inhibited, but because glucose exposure of functionally mature β-cells is limited due to the lack of circulation. There is an attempt of demonstrating that mature β-cells exist in islets using a MafA antiserum, but there is no evidence that this antiserum works, let alone detects zebrafish MafA despite the considerably evolutionary distance between fishes and mammals (beyond the manufacturers claims it may, which is clearly insufficient validation). It is telling that the images of whole mount MafA staining appear to be cytoplasmic and do not overlap well with insulin, while MafA is a nuclear transcription factor of β-cells that typically requires antigen retrieval for detection. A similar problem arises for the experiments where calcineurin/NFAT is inhibited. Doing so inhibits calcium responses in vivo and is interpreted as a reduction in β-cell maturity. The possibility that blockade of calcineurin/NFAT blocks β-cell function is not considered, yet likely. After suggesting that maturation of β-cells starts at the mantle and progresses to the core, this model is transplanted to mouse β-cells. The rationale is that 'β-cells of neonatal mouse islets respond poorly to glucose and need more than one week to mature in vivo (Blum et al., 2012).' Actually, this paper by Blum showed that β-cells in the first days post-partum are more sensitive to glucose and that their glucose threshold increases as the islets mature. This was subsequently shown by others to be caused by the onset of intra islet feedback on β-cell function. It appears that the experiments on mouse islets in this current manuscript are based on only a handful of the pertinent papers that have either not been carefully read or have been mis-understood. To demonstrate that maturation proceeds from mantle to core in mouse islets, the investigators assay glucose uptake using a fluorescent glucose tracer. They observe highest uptake in the outer layers of the islet and appear to interpret this as evidence in support for a model where maturation proceeds from the mantle to the core? But these islets are done in 8-week old islets, when the entire β-cell mass has long since matured. There is no evidence that the cells that take up glucose tracer at the periphery are actually β-cells, as the mouse islet mantle is the site of α- and δ-cells. I could not find any indication to rule out that the selective labeling of the mantle is caused by the limited diffusion of the tracer into the islet core. The effects of calcineurin on zebrafish β-cell function and maturation appear to confirm published work from over a decade ago. The novelty of these findings may be limited to the zebrafish pancreas field. 1) In several places in the text, the authors refer to β-cell proliferation. However, there are no assays actually performed to assess β-cell proliferation. Either the authors need to perform these experiments, or they need to remove such wording from the manuscript. They can refer to an increase in β-cell number, but in the absence of any direct evidence, one could not state with certainty whether this was from proliferation or neogenesis. 2) The videos should be annotated to help the viewer. There were many times that I did not know what I was looking at, did not know when glucose had been added, if at all, and could not tell what the changes were that I should be focusing on. 3) In Figure 3C, the authors show that 20 mM glucose is not the optimal glucose concentration for the effects they are interested in. In fact, 8 mM glucose seems to be better. Why then do they use 20 mM glucose for most experiments? 4) In the Discussion, the authors refer to "locally synthesized glucose" as initiating β-cell maturation. What does this mean? What is the source of glucose? Along those lines, since feeding has not yet begun at 72 hpf, and the source of nutrition is the yolk, how do the authors correlate β-cell maturation in the fish with the changes noted in mice at the time of nursing initiation and switching to chow at weaning? 5) The authors have not "discovered" heterogeneity in β-cell maturation (Discussion, second paragraph). Their data do nicely support previous studies showing β-cell maturation heterogeneity looking at Ucn3 and MafA expression. Please cite these previous studies appropriately. 6) The authors refer incorrectly to previous studies of islet vascularization in the mouse (Discussion, second paragraph). They are referred to Brissova et al. (2006, Diabetes) which shows very nicely that blood flow precedes islet morphogenesis. How do they interpret their findings in light of this previous study? 7) There are several data sets for which a t-test is not appropriate. Any time multiple treatments are being compared, an ANOVA should be used. Please consult with a statistician. 8) In Figure 1—figure supplement 2, what is the rationale for the time points examined? Waiting 3 minutes until after glucose administration to start collecting the data seems too long. Likewise, taking an image once a minute seems too far apart. I am concerned that the authors missed something. 9) Are the VE+ cells the same cells that are Glu+ (Figure 2B). How do the authors define VE β-cells? 10) In Figure 2C, what are the holes? α-cells, β-cells not expressing the reporter? Other endocrine cells? Why are there some cells outlines with no color assigned? 11) It needs to be made clearer that Figure 5A-C is from islets from 8-week-old mice, not neonates. Thank you for submitting your article "In Vivo Imaging of β-cell Function Reveals Glucose-mediated Heterogeneity of β-cell Functional Development" for consideration by eLife. Your article has been reviewed by three peer reviewers, and the evaluation has been overseen by Marianne Bronner as the Senior and Reviewing Editor. The reviewers have discussed the reviews with one another and the Reviewing Editor has drafted this decision to help you prepare a revised submission. The most essential revisions are summarized below, but we refer you to the individual reviewer comments for further details. Here, the authors use light-sheet microscopy to image the pancreatic β-cells in zebrafish and in cultured mouse cells. While conventional confocal and light-sheet microscopy is not adequate for their functional imaging, their enhanced multi-photon light-sheet is capable of recording with the needed resolution. They find a number of changes over time and heterogeneities in the level and synchrony of intracellular calcium transients and also address the potential role of glucose, calcineurin and NFAT in the development of responsive β-cells. 1) It is critical to address possible off target effects of the pharmacological reagents. A control experiment needs to be added showing that the calcium levels of a totally unrelated cell type (e.g. a CNS neuron) are not affected as observed in pancreas cells. 2) The dominant negative experiments are not convincing. If the perturbing dominant negative construct does nothing more than make the cells thrive a little less, the obtained result (slowing the appearance of marker in the expressing cells) would be predicted to result. This is likely an artifact that needs to be carefully controlled. 3) The mouse studies are incomplete and seem to have been performed with inadequate attention to standardization. The Glucose Simulated Insulin Release (GSIS) studies are not presented in the text of the Results and in Figure 5. The calcium imaging and GSIS are performed at different concentrations. 4) The finding should be more completely presented and fully addressed in the text and with appropriate statistical treatments. In this manuscript, the authors use light-sheet microscopy to image the pancreatic β-cells in zebrafish and in cultured mouse cells. They show that conventional confocal and light-sheet microscopy is not adequate for their functional imaging, but that their enhanced multi-photon light-sheet is capable of recording with the needed resolution. The authors find a number of changes over time and heterogeneities in the level and synchrony of intracellular calcium transients. They argue that the zebrafish β-cells mature from the mantle to the core, but become indistinguishable by 72 hours. Imaging the labeled vasculature showed a similar progression, so the mantle-core difference is likely due to vascularization. Blocking the heartbeat suggests this is due to the circulation rather than the vascular endothelium. The authors address the potential role of glucose in the development of responsive β-cells, and offer several findings that are interesting, but seem incomplete. The studies showing the delivery of labeled glucose analogs show an apparent non-linearity that suggests there are unknowns not being addressed. A dose of a labeled glucose analog that is 2.5 times higher completely penetrates the core; the smaller dose completely fails, as described. The concentrations used in the glucose studies seem to range widely, from physiological to toxic. "The first glucose responsive β-cells that appeared at 48 hpf were all EGFP negative, indicating that dn-zCnA prevents β-cells from acquiring glucose responsiveness." If the perturbation prevented the glucose responsiveness, it would not just be the first cells that are perturbed. Slowing could result from a variety of issues that are non-specific, just from expressing the perturbing transgene. The mouse studies are incomplete and seem to have been performed with inadequate attention to standardization. The Glucose Simulated Insulin Release (GSIS) studies are not presented in the text of the Results and in Figure 5, the calcium imaging and GSIS are performed at different concentrations. This study has many interesting aspects to it, and it is clear that the approaches being deployed will offer important insights. It is within the authors' grasp to create a convincing and complete analysis of each of the findings they present, without any heroics or development of new technologies. The present version of the manuscript is a patchwork of incomplete studies that do not resolve any of the exciting aspects the study offers access to. I found the manuscript unconvincing, and incompletely presented. For example, it offers descriptions of results that are incompletely presented or misleading (see the comments on the penetration of labeled glucose analogs, and on the dn-zCnA studies). I would strongly recommend that the present version be rethought, and focus on presenting an analysis of either the zebrafish or the mouse, creating a substantial contribution to the literature. The paper by Zhao et al. provides an in vivo analysis of developing pancreatic cells which is particularly challenging given that these cells are deep within the embryo. 1) Their comparisons of different microscopes convincingly showed that their 2P3A-DSLM provided the best images. I see that they deconvolved their two-photon light-sheet data. Did they deconvolve the other data as well? One thing I could not determine from their methods was if they rotated the embryo to collect multiple views of each embryos to improve their Z-resolution (as in the classic SPIM paper)? This would also make their data more isometric. I think their spinning disc confocal data would have looked better with a higher magnification lens that the 10x they used. 2) Their finding that glucose responsive β-cells appeared in vivo earlier than previously reported (48 hpf instead of 52 hours) was very interesting. 3) The increase in calcium activity from the mantle to the core was another interesting finding. One question I had about the increase in calcium signaling from 56 to 72 hpf was whether these were the same cells or new cells with increased activity. Their data should easily reveal this, and it is an important point for them to mention. 4) Their hypothesis that blood vessels initiated β-cell functional development as measured by calcium activity may be true but the data from the cloche mutant and their pharmacological reagents (e.g. BDM) doesn't exclude another hypothesis, that β-cell functional maturation may cause these cells to secrete a factor that promotes angiogenesis. Remember blocking circulation early did not affect β-cells' ability to acquire glucose responsiveness. I am glad that the authors went beyond the correlation to actually test their hypothesis though it seems like their conclusions are still based more on correlation than causation. 5) I felt that the authors data from the cloche mutant and their dnCalcineurin line were more convincing than their data from pharmacological reagents for which I'm always concerned about off target effects. How specific are these particular reagents? The authors say they did careful dose response curves but the control I would really like to see is if the drugs affected calcium signaling in a totally unrelated cell like a CNS neuron. Do calcium levels change in these cells with drug treatment? I would be more convinced by data from Calcineurin or NFAT mutants. I'm not fond of calling calcineurin/NFAT signaling a "master regulator" as they did in Figure 4. The authors state that calcineurin/NFAT signaling is a major pathway for glucose mediated β-cell development but that didn't seem to be the case for outer cells at 56 hpf? 6) I'm a little surprised that the data in Figure 3 did not show larger differences. I do agree that the 20 mM Glucose concentration is likely toxic and so it shouldn't be used. 7) For the mouse data the authors used 20 mM Glucose level to activate insulin. Is this concentration not toxic for mouse islet cells? I was also a little confused by the calcineurin/NFAT independence at low glucose level but dependence at high glucose levels. In the Discussion it was a little difficult to compare the mouse and fish data because insulin levels were only measured in the mouse. For mouse cells they had to use a drug since they didn't have the dnCalcineurin transgenic they used in fish. Thank you for resubmitting your work entitled "In Vivo Imaging of β-cell Function Reveals Glucose-mediated Heterogeneity of β-cell Functional Development" for further consideration at eLife. Your revised article has been favorably evaluated by Marianne Bronner (Senior Editor) and 2 of the original reviewers. 1. The response to reviewer #3, point 4 is great but it's not in the paper. Please include in the manuscript a sentence or two from the response to this reviewer. Same for reviewer #3, point 6. Why not mention that a living organism may have some buffering mechanism in the relevant part of the paper? That would be a nice Discussion point. 2. In the figure legends, it might be good to mention that inside = core and outside = mantle. In the text they only use the terms core and mantle which is appropriate. 3. Subsection “Fine glucose concentrations regulate the heterogeneous development of β-cell function in vivo”, first paragraph: “periphery” should be “peripheral”. 1) We have demonstrated that β-cells that do not show a calcium response have access to the transient increase of glucose under high glucose incubation.By using fluorescent deoxyglucose analog 2-NBDG to incubate fish embryos, we demonstrated that physiological dose of glucose (8 mM) did not penetrate islet core without microcirculation (Figure 2—figure supplement 3). The lack of the chronic induction of physiological dose of glucose led to defective β-cell functional development in islet core from 72 hpf cloche mutants and BDM-treated embryos (Figure 2F). On the other hand, supraphysiological dose of 2-NBDG (20 mM) readily penetrated islet core even in cloche mutants without any circulation (Figure 2—figure supplement 3). Functionally, defective β-cells in the islet core of cloche mutants could be rescued by direct activation of calcineurin, again indicating that these cells can be accessed by high glucose (Figure 4C).Therefore, islet microcirculation is essential for chronically delivering physiological dose of glucose to β-cells in the islet core for their functional development in vivo, but does not prevent their function to be evaluated under acute stimulation with supraphysiological dose of glucose. 2) Not only have we figured out the reason of the difference between Blum’s data and our previous data, but also unraveled two mechanistic different functional maturation processes of β-cells, including a previously unappreciated one.By systematically examining insulin secretion of neonatal and adult mouse islets cultured under different concentrations of glucose (Figure 5), we found that β-cell maturation ex vivo composes of two processes: the reduction of low glucose-stimulated insulin secretion and the increase of high glucose-stimulated insulin secretion. While calcineurin/NFAT participates in prompting high glucose-stimulated insulin secretion, glucose also activates other downstream pathways to reduce low glucose-stimulated insulin secretion. 3) Per your suggestion, we have systematically evaluated four commercially available MafA antibodies that target conserved epitopes in zebrafish, and found none of them labeled nucleus structures of β-cells in adult fish. Therefore, we have completely removed all MafA-related data from the manuscript. On the other hand,the variable functions of neonatal mouse islets cultured under different concentrations of glucose speaks for the importance of being able to image β-cell function in vivo. By displaying that glucose-induced calcium responses correlated nicely with glucose-stimulated insulin secretion in mouse neonatal islets cultured in vitro(Figure 5), we further demonstrate that glucose-induced calcium response is a reliable and sensitive marker of β-cell function. Moreover, the mechanisms of functional development of β-cells revealed by visualizing glucose-induced calcium responses from individual β-cells in live zebrafish embryos were confirmed in mouse islets, reinforcing the validity of using glucose-induced calcium responses as a marker of β-cell function status. 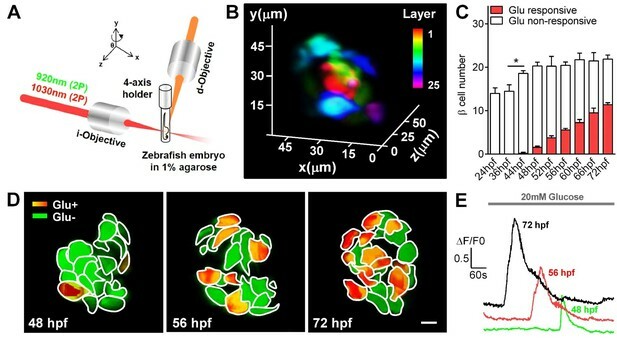 This manuscript describes experiments where β-cells within the developing zebrafish embryo are imaged using a two-photon light-sheet microscope. The stated rationale for doing so is the ability of monitoring β-cell activity in situ in a non-invasive manner. While these are technically demanding experiments, the spatial and temporal resolution of the image data is limited compared to what has been recently reported using more conventional microscopes in an ex vivo setting. We thank you for the appreciation of our technology as “non-invasive” and “technically demanding”. Because the islets within live zebrafish we imaged did not have a fine structure, our high-resolution two-photon light-sheet microscope seemed to have a resolution inferior to the imaging under ex vivo setting. However, we were able to resolve calcium transients from single β-cells in live fish in vivo (Videos 2-3 and 5-6), which can only be achieved in isolated islets from zebrafish older than 4 dpf as shown by others (Singh, Janjuha et al., 2017). As we have shown that the function of isolated islets are susceptible to their culture conditions (Figure 5), we argue that to be able to image β-cell function in vivo offers a clear advantage as compared to ex vivo imaging, which becomes possible due to our innovation in the microscope itself. The novel insight that is afforded by this technique and is therefore limited and while the choice for zebrafish as a model is transparent and well-justified, it inevitably raises questions regarding the degree of similarities between zebrafish and rodent β-cells including if β-cells in the zebrafish islet are coupled via gap junctions (the videos provided suggest not? ), what the glucose threshold is for a zebrafish β-cell (what is non-fasting plasma glucose in a zebrafish anyway). 1) The composition of cell types and the structural organization of pancreas in zebrafish are similar to mammalian (Prince, Anderson et al., 2017). This is also why the knowledge from zebrafish developmental biology research helps in establishing protocols for differentiating embryonic stem cells into β-cells. 2) Following your suggestion, we did observe synchronized Ca2+ signals among neighboring β-cells in some islets of 72 hpf zebrafish (Figure 1—figure supplement 4D-E). This data implies that β-cells within zebrafish islets are connected by gap junction, which may become even more prominent as the fish matures. We have added this information in our revised manuscript (Figure 1—figure supplement 4D-E, Video 2 and subsection “Visualization of embryonic β-cell function in vivo using 2P3A-DSLM”, last paragraph). 3) The fasting plasma glucose measured in adult zebrafish is about 2.8 mM, while the peak of the OGTT (after oral administration of 1.25 mg glucose/g body weight) reaches around 8.3 mM (Zang, Shimada et al., 2017). These values are also comparable to the normal range of plasma glucose fluctuations in rodents. 4) Finally, the calcineurin/NFAT-dependent β-cell maturation process in zebrafish also operates in the maturation of neonatal mouse islets during ex vivo culture (Figure 4 and Figure 5), demonstrating the conserved maturation mechanism in both zebrafish and rodents. Also, the zebrafish islet in the paper is divided into a mantle and core, but with only 15-20 β-cells making up the islet, it is questionable if there truly is a mantle/core distinction such as the one that is readily apparent in rodent islets. We appreciate your concern. A key benefit of our two-photon light-sheet microscope (2P3A-DSLM) is its nearly isotropic resolution in 3D, which outperforms two-photon point-scanning microscope in resolving tightly packed structures in axial direction. As shown in Figure 2—figure supplement 1A, B, we could determine whether a cell was inside or at the periphery of the islet based on information obtained from 2D sections and 3D reconstructions. Core cells (enclosed by red lines) were classified as cells that were adjacent to other cells but not faced to the open field. We have added this information in our revised manuscript (Figure 2—figure supplement 1A and B and in the first paragraph of the subsection “Sequential initiation of β-cell functionality from the islet mantle to the core is coordinated by islet vascularization”). If we performed similar experiments using two-photon microscopy, its poor axial resolution would yield obscure 3D reconstructions that would prevent a clear-cut distinction of mantle and core cells. The visualization of the vascularization of the islet during development is nice but would not have required a two-photon light-sheet setup. 1) As shown in Figure 2—figure supplement 1,we were able to clearly differentiate β-cells in the mantle or in the core, which could not be achieved with the two-photon point scanning microscope (see also responses above). The high spatial resolution also helped us to sort out the spatial relationship of islet vessels with glucose-responsive β-cells (Figure 2—figure supplement 2C-E). 2) Besides difference in axial resolution, our two-photon light-sheet microscope confers much reduced photo-bleaching as compared to the point scanning two-photon microscope (Zong, Zhao et al., 2015). We believe that low photo-bleaching and photo-toxicity are essential for monitoring β-cells function in vivo without perturbing their development and function (Videos 2-3 and 5-6). The major concern is that throughout the paper, β-cell maturation and function are conflated. This betrays a serious flaw in the premise of the work that pervades the entire paper. Transgenic zebrafish are used that express the Rcamp red calcium indicator in β-cells. These fish are exposed to glucose and an Rcamp response to glucose is interpreted to indicate functional maturity of the responding β-cells. Using this approach, the investigators observe calcium responses first on the outside of the islet followed by β-cells in the islet core and conclude from this that β-cells mature from mantle to core. The problem with this interpretation is that if β-cells at the core were mature but were not exposed to glucose, they would not respond with a calcium response. Indeed, the investigators then demonstrate the vascularization proceeds from the mantle to the core and suggests that the mantle β-cells respond first simply because they are exposed to the circulation earlier in development. The experiments where vascularization is perturbed chemically or via genetic perturbation predictably cause reduced β-cell functionality, but likely not because β-cell maturation is inhibited, but because glucose exposure of functionally mature β-cells is limited due to the lack of circulation. We thank you for pointing out this concern. To address this question, we have performed two new experiments. 1) Within 5 min after addition of 20 mM fluorescent deoxyglucose analog 2-NBDG to 56 hpf and 72 hpf cloche mutants, we did observe uptake of 2-NBDG into all of the Rcamp1.07-labeled β-cells in vivo even though blood circulation in these fish was completely absent (Figure 2—figure supplement 3A). In contrast, addition of 8 mM 2-NBDG failed to label the core β-cells of 56 hpf wild type fish (Figure 2—figure supplement 3B). 2) Additionally, by supplementing CGA (calcineurin activator) to cloche mutants, we were able to increase both the number and the function of glucose-responsive β-cells in the islet core at 72 hpf (Author response image 1). Based on these data, we conclude that high glucose (20 mM) did penetrate into the islet core and reach all the β-cells within the islet even without circulation. The defective function of β-cells in the islet core of cloche mutants can be rescued by direct activation of calcineurin, again indicating that these cells can be accessed by high glucose. Therefore, islet microcirculation is essential for chronically delivering physiological dose of glucose to β-cells in the islet core for their functional development in vivo, but does not prevent their function to be evaluated under acute stimulation with supraphysiological dose of glucose. We have put all these supporting evidence in our revised manuscript (Figure 2—figure supplement 3, subsection “Sequential initiation of β-cell functionality from the islet mantle to the core is coordinated by islet vascularization”, third paragraph, subsection “Fine glucose concentrations regulate the heterogeneous development of β-cell function in vivo”, first paragraph and Figure 4, Figure 4—figure supplement 1C, subsection “Glucose-induced calcineurin/NFAT activation to initiate and enhance β-cell functionality”, first paragraph). Supplementing CGA rescued the defective β-cell function in both the core and the mantle of the islet in 72 hpf cloche mutants. (A-B) In Tg (ins:Rcamp1.07); cloche mutants at 72 hpf, supplementing CGA significantly rescued the number (A) and the maximal Ca2+ influx (B) of glucose-responsive β-cells both in the islet core and in the islet mantle. *P < 0.05, **P < 0.01; ns, not significant. There is an attempt of demonstrating that mature β-cells exist in islets using a MafA antiserum, but there is no evidence that this antiserum works, let alone detects zebrafish MafA despite the considerably evolutionary distance between fishes and mammals (beyond the manufacturers claims it may, which is clearly insufficient validation). It is telling that the images of whole mount MafA staining appear to be cytoplasmic and do not overlap well with insulin, while MafA is a nuclear transcription factor of β-cells that typically requires antigen retrieval for detection. 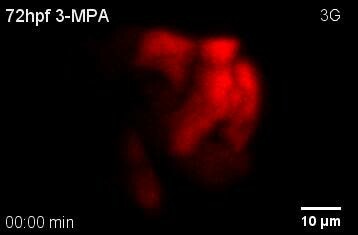 1) None of the current MafA antibodies labeled nucleus in zebrafish β-cells. We have tried to use the original MafA antibody (SAB2101414, Sigma) to label β-cells in isolated adult zebrafish islets. As shown below, they still displayed diffusive fluorescent signals in the cytosol, with no nuclear targeting signals. We also tested other available antibodies targeting possibly conserved epitopes of MafA (ABE1404, Millipore; A300-611A, Bethyl; and IHC-00352, Bethyl), whereas none of them labeled nucleus (data not shown). MafA antibody used in mouse exhibited non-specific cytoplasmic signals in β-cells of zebrafish. 2) MafA expression was detected in the exocrine regions of pancreas rather than β-cells in zebrafish by in situ hybridization.Using in situ hybridization with anti-MafA probe, we could not detect any MafA expression in GFP-positive β-cells, but instead we detected MafA expression in the exocrine regions of pancreas in 12 dpf Tg (ins: EGFP) larvae (Author response image 3). This finding is consistent with the report that zebrafish MafA is not expressed in adult β-cells, but in exocrine pancreas (Matsuda, Mullapudi et al., 2017). MafA was not expressed in the β-cells, but was expressed in the exocrine pancreas in larval zebrafish. 3) Expression of ucn3 in both α- and β-cells of zebrafish. Per another comment, we also tested whether ucn3 could be used to evaluate the maturity of β-cells in zebrafish embryos. To our surprise, we found that both β-cells and α-cells in zebrafish expressed high levels of ucn3 (Author response image 4), which is consistent with human islet data (van der Meulen, Xie et al., 2012) but arguing against the opinion that ucn3 is a specific maturation factor of β-cells. ucn3 expression pattern in zebrafish islets at different developmental stages. (A) Immunofluorescent labelling of insulin and ucn3 in zebrafish islets at indicated stages. (B) Quantification of ucn3-positive β-cells in zebrafish islets at the indicated stages in A. n = 6-12 islets per condition. 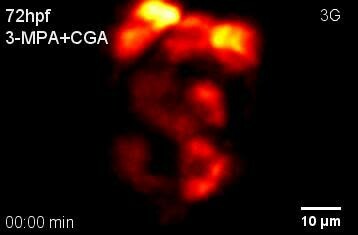 (C) Immunofluorescent labelling of glucagon and ucn3 in zebrafish islets at 72 hpf. (D) Quantification of ucn3-positive α-cells in zebrafish islets at 72 hpf. n = 10 embryos. Per your suggestion, we have compared effects of acute and long-term incubation of calcineurin/NFAT inhibitors. As shown in Author response image 5, acute or short-term incubation of calcineurin/NFAT inhibitors (FK506 or VIVIT, less than 3 hrs) did not affect 20 mM glucose-stimulated calcium responses per se; in contrast, only after long-term incubation over 6 hrs did these β-cells exhibit reduced high glucose-stimulated calcium responses in vivo. This demonstrates that the calcineurin/NFAT inhibitors do not directly impair the β-cell functional machinery. The reduction in glucose-stimulated calcium responses was due to the diminished calcineurin/NFAT signaling pathway required for the β-cell maturation. Blockade of calcineurin/NFAT led to reduced β-cell maturity. (A-B) In 60 hpf Tg (ins:Rcamp1.07) embryos, not acute/short-term, but only long-term incubation with calcineurin/NFAT inhibitors significantly reduced the number (A) and the maximal Ca2+ influx (B) of high glucose-responsive β-cells. After drug removal, the Ca2+ influx of some cells was recovered faster than the number of the glucose-responsive β-cells. *P < 0.05, **P < 0.01. A key difference between Blum’s data and our previous data is that their neonatal β-cells released more insulin at low glucose condition than mature β-cells, which was not observed in our previous data. Thanks to your reminder, we have noticed that Blum et al. used low glucose (5.6 mM) to culture the neonatal islets. Therefore, we have systematically examined insulin secretion of neonatal and adult islets cultured under different concentrations of glucose. As compared to adult islets, neonatal islets cultured in medium with 5.6 mM or 7 mM glucose did exhibit more basal insulin secretion under 3 mM glucose stimulation(Figure 5A, B, D, E), which confirms Blum’s finding. Interestingly, low glucose-stimulated excessive insulin secretion of the neonatal islets was not affected by including CGA in the culture medium but was abolished by increasing the glucose concentration in the culture medium to 11/15/20 mM. These data have highlighted the profound impacts of ex vivo glucose concentration on neonatal β-cell functional development. Thus, to be able to image β-cell function in their native environment offers a clear advantage. On the other hand, culturing neonatal islets with medium containing 5.6/7/11 mM glucose and CGA significantly enhanced high glucose-stimulated insulin secretion. In fact, with 11 mM glucose and CGA in the culture medium, GSIS of neonatal islets reached the maximum that is indistinguishable from the responses of adult islets. In this regard, β-cell maturation ex vivo composes of two processes: the reduction of low glucose-stimulated insulin secretion, and the increase of high glucose-stimulated insulin secretion. While both processes were enhanced by an optimal glucose concentration (11 mM) in the culture medium, calcineurin activator CGA selectively facilitated the latter process (Figure 5A, B, D, E). Finally, we used mouse islets cultured in vitro to evaluate the correlation between glucose stimulated calcium transients and GSIS. As compared to adult islets, neonatal islets cultured in medium with 5.6 mM glucose also exhibited significantly higher ensemble calcium transients upon stimulation with 2.8 mM glucose; these 2.8 mM glucose-triggered calcium transients were abolished if neonatal islets were cultured in 11 mM glucose, and became indistinguishable from those of adult islets. Moreover, although including CGA in the culture medium did not reduce low glucose-triggered calcium transients in neonatal islets cultured in 5.6 mM glucose, it did enhance the maximal amplitude of calcium transients triggered by 16.7 mM glucose in neonatal islets cultured both in 5.6 and 11 mM glucose (Figure 5A, B, D, E). Therefore, glucose-induced calcium response is a reliable and sensitive marker of β-cell function status. We have updated the related figures (Figure 5 and Figure 5—figure supplement 1) and incorporated related discussion in the manuscript (Discussion, second paragraph). We are sorry for the misunderstanding. This figure is not intended as evidence for the maturation model from the mantle to the core, but to show that low concentrations of glucose did not penetrate into the islet core as efficiently as they reach the islet mantle in the absence of blood circulation in isolated islets cultured in vitro. 2-NBDG is a fluorescent deoxyglucose analog that can be taken up by the cells through glucose transporters, thus its fluorescence can be used to quantify the glucose uptake by the cells. In contrast to a limited diffusion of 7 mM of the tracer into the islet core, we have tried to label islets from the transgenic mice whose α-cells are genetically labeled with EYFP with high concentration of 2-NBDG (20 mM). Under this condition, we were able to observe relatively homogenous labeling of cells within the islet core, in contrast to little labeling of α-cells at the islet periphery (Author response image 6). This result is consistent with the previously reported non-β-cells’ glucose uptake rate lower than that of β-cells (Heimberg, De Vos et al., 1995). To avoid the misunderstanding, we have used the following related zebrafish figures to replace this mouse data in the manuscript (Figure 2—figure supplement 3). α-cells in isolated mouse islets almost did not take up 2-NBDG. Representative z-stack images of 2-NBDG (green) and EYFP (a red pseudo-color) signals in isolated 8-week-old mouse islets from the transgenic mice, whose α-cells are genetically labeled with EYFP after incubation with 20 mM 2-NBDG for 10 min. Similarly, 8 mM 2-NBDG (glucose) did not reach the islet core in 56 hpf fish in the absence of islet circulation, but fully penetrated the whole islet at 72 hpf when islet circulation had developed (Figure 2—figure supplement 3B). In contrast, 20 mM 2-NBDG (glucose) readily penetrated the islet core in 56 hpf control fish, 56 hpf and 72 hpf cloche mutants that had no blood circulation (Figure 2—figure supplement 3A). Collectively, these data argue that physiological dose of glucose needs delicate intra-islet circulation to be delivered to the islet core, while supra-physiological dose of glucose does not require circulation to penetrate the islet core. Thus, β-cells in the core in vivo may exhibit arrested functional development because of inefficient endogenous glucose delivery without blood circulation, but their function could still be tested by acute application of supra-physiological dose of glucose. In supporting this assertion, we have shown that CGA application rescued the dysfunctional β-cells in the islet core in cloche mutants (Figure 4), and also potently enhanced insulin secretion of neonatal mouse islets cultured in vitro (Figure 5). We have added this information in our revised manuscript (Figure 2—figure supplement 3, subsection “Sequential initiation of β-cell functionality from the islet mantle to the core is coordinated by islet vascularization”, third paragraph and subsection “Fine glucose concentrations regulate the heterogeneous development of β-cell function in vivo”, first paragraph). We also added the working principle of 2-NBDG in the Materials and methods in the new version of our manuscript (subsection “Uptake of the fluorescent D-glucose analogue by live zebrafish embryos”). 1) By developing an innovative microscopy method, we are able to directly visualize single β-cell function in a living organism in a non-invasive manner. 2) With this advanced technology, we have revealed the heterogeneous β-cell functional development in zebrafish in vivo, which highlighted an essential role of islet microcirculation that delivers optimal glucose to β-cells and activates downstream calcineurin/NFAT. 3) The current finding is not limited to zebrafish pancreas field. In mouse neonatal β-cells cultured in vitro, we have delineated two parallel processes contributing to the β-cell maturation. While optimal glucose is essential for the reduction of low glucose-stimulated insulin secretion, the combination of optimal glucose and calcineurin activator potentiates high glucose-stimulated insulin secretion to an extent indistinguishable from that of adult β-cells. This finding may inspire stem cell researchers to use this previously unexplored strategy to promote the optimal maturity of the stem-cell derived β-like cells within clusters in vitro. Therefore, we believe our findings will attract common interest from both the top experts in the research field and the broader audience of eLife. Thank you. Per your suggestion, we have made corrections in the new version of our manuscript. Thank you for your suggestion. We have made new versions of viewer-friendly videos with annotations (Videos 3, 5 and 6in our revised manuscript). In addition, we have also added a new video to show the synchronized Ca2+ transients of β-cells within a live 72 hpf zebrafish embryo (Video 2). Indeed, 8 mM glucose is the optimal concentration for long-term incubation to rescue β-cell function when endogenous glucose synthesis is suppressed by 3-MPA (an inhibitor of gluconeogenic phosphoenolpyruvate carboxykinase 1) during the late hatching period. In contrast, we transiently applied 20 mM glucose to acutely stimulate β-cells in vivo and in vitro to evaluate their function status. Prior to feeding, zebrafish embryos depend on passive diffusion or circulation of nutrition from yolk stores. The yolk syncytial layer (YSL) between the yolk and embryo proper is believed to regulate nutrient transfer from the yolk to the embryo proper. It starts to express gluconeogenic pck1 as early as 11 hpf, which is associated with increasing glucose in the embryos (Jurczyk, Roy et al., 2011). Thus, YSL is a potential site for endogenous glucose synthesis, and is in close proximity to the islet. We have added this information in our revised manuscript (subsection “Fine glucose concentrations regulate the heterogeneous development of β-cell function in vivo”, first paragraph). Besides, we also compared pancreas development between zebrafish and mouse in Supplementary file 1. Based on our findings and the literature, the period from 48 to 72 hpf in zebrafish equals to P2 and some days after P2 in mice. We speculate that 5 to 7 dpf in zebrafish when it begins to feed may correspond to the weaning stage in mice. Thank you for the reminder. We have corrected the manuscript and cited the previous studies as suggested (Introduction, first paragraph). Thank you for raising this interesting question. We believe that our findings in fish are overall conserved to those of the mouse. Brissova et al. (2006) have demonstrated that islet blood flow establishes after the formation of small endocrine cell clusters, then “development of islet microvasculature and establishment of islet blood flow occur concomitantly with (or precedes) islet morphogenesis” (Brissova, Shostak et al., 2006). In our hands, although islet blood flow is absent in 48 hpf fish, it started to penetrate into the islet structure. Later this primitive islet structure will also undergo significant changes in the overall size and the position. In this sense, establishment of islet blood flow also occurs concomitantly with/precedes the final islet morphogenesis. Thank you for the suggestion. In fact, all statistics were performed using GraphPad Prism 6 software (GraphPad Software Inc., La Jolla, CA). Unpaired Student’s two-tailed t-test was used to compare data between two indicated groups. We used one-way ANOVA followed by Dunnett’s test to do multiple comparisons with the control group. The description of statistical analysis has been corrected in the new version of our manuscript (subsection “Statistical analyses”). We actually collected data continuously both before and after glucose stimulation. As the oscillation frequency of calcium signals in pancreatic β-cells is in minute-scale (Grapengiesser, Dansk et al., 2003), we captured time-lapse images once a minute to prevent severe photo-bleaching in our previous experiment. To address your concern, we re-did the experiments at 1 Hz with 100 ms exposure time under a spinning-disc confocal microscope. We have replaced the previous figure with the new figure in our revised manuscript (Figure 1—figure supplement 2 and subsection “Visualization of embryonic β-cell function in vivo using 2P3A-DSLM”, first paragraph). Our data showed that most of the Glu+ β-cells were VE+ β-cells, but not all the VE+ β-cells were Glu+ cells at different developmental stages (Figure 2—figure supplement 2C-E in our revised manuscript). We defined the VE+ β-cells as the β-cell located directly adjacent to vascular endothelia cells by using Tg (ins:Rcamp1.07); Tg (flk1:GFP) double transgenic zebrafish. We have put this information into supplementary materials in our revised manuscript (Figure 2—figure supplement 2C-E and subsection “Sequential initiation of β-cell functionality from the islet mantle to the core is coordinated by islet vascularization”, second paragraph). You are correct. The holes among β-cells are other kinds of endocrine cells, such as δ-cells and α-cells. Per your suggestion, we carefully checked again the raw data and our self-developed MATLAB program used for the inside-and-outside cell classification for the original Figure 2C. There was indeed a small bug in the source code of the program, which missed the cells with weak fluorescent signal. We have now corrected the Figure 2C as the new version of Figure 2A. 11) It needs to be made clearer that Figure 5A-C is from islets from 8 week old mice, not neonates. Thank you. Per your suggestion, we have deleted the in vitro mouse data in previous Figure 5A-C, instead added the in vivo zebrafish data into the supplementary materials in our revised manuscript (Figure 2—figure supplement 3, subsection “Sequential initiation of β-cell functionality from the islet mantle to the core is coordinated by islet vascularization”, third paragraph and subsection “Fine glucose concentrations regulate the heterogeneous development of β-cell function in vivo”, first paragraph). Following your suggestions, we have done additional control experiments to test possible off-target effects of these pharmacological reagents (10 mM BDM, 3 mM 3-MPA, 10 μm FK506 and 141.2 μm CGA) on neuronal activities. We measured calcium activities from CNS neurons in Tg (elavl3:Gcamp6s) zebrafish, in which neurons were labelled by the calcium indicator Gcamp6s. The result showed that the calcium dynamics in CNS neurons were not affected by any of these pharmacological treatments, supporting their specificity in affecting β-cell functional development only (Author response video 1). We have added this important information in our revised manuscript (Figure 4—figure supplement 2 and legend, subsection “Glucose-induced calcineurin/NFAT activation to initiate and enhance β-cell functionality”, last paragraph). Thank you for this insightful comment. We have sorted out two pieces of evidence that support the specific role of calcineurin/NFAT in β-cell functional development. Firstly, by adding numbers of insulin-positive cells at different stages to the histogram (Author response image 7, Figure 4E and legend, subsection “Glucose-induced calcineurin/NFAT activation to initiate and enhance β-cell functionality”, last paragraph), we show that genetic perturbation of calcineurin did not affect β-cell proliferation at different stages. In addition, we have examined the fish at another elder stage. Despite the progressive functional maturation of more β-cells in control embryos from 72 hpf to 7 dpf, the mean number and response of glucose-responsive β-cells in 7 dpf dn-zCnA embryos were not different from those in 72 hpf dn-zCnA ones. Therefore, β-cell functional maturation is specifically arrested at the stage of 72 hpf in dn-zCnA fish embryos. Genetic perturbation of calcineurin/NFAT signaling persistently prevented the glucose-responsiveness of β-cells. (A-B) Numbers of glucose-responsive β-cells (A) and their maximal Ca2+ responses to glucose (B) in age-matched control and dn-zCnA-expressing embryos at 48 hpf, 72 hpf and 7 dpf. n = 5-7 embryos per stage. *p < 0.05, **p < 0.01, ***p < 0.001; ns, not significant. Per your suggestion, we have standardized our results in mouse studies by adding two new graphs (Figure 5C and Figure 5F), showing the fold changes of GSIS (Figure 5C) and maximal amplitude of glucose-induced calcium influx under stimulation and resting conditions (Figure 5F). We also presented this information in the text of our revised manuscript (subsection “Direct activation of calcineurin promotes the high-glucose-stimulated secretion but does not reduce the low-glucose-stimulated secretion of neonatal β-cells in isolated mouse islets in vitro” and Figure 5 legend). The calcium imaging and GSIS experiments were conducted at different glucose concentrations because: (1) GSIS assay in mouse was designed to be consistent with zebrafish studies, in which we used 20 mM glucose as the stimulation (Figure 5A-5C); (2) The calcium imaging experiments in mouse islets were added to address reviewer’s previous question, to show the similarities and differences of our work to the previous study from Douglas Melton group (Blum et al., 2012). Therefore, we used 2.8 mM and 16.7 mM glucose to follow Melton’s precedent. Nevertheless, we have done additional experiments to compare calcium activities of islets stimulated under different conditions (from 2.8 mM to 16.7 mM versus from 3 mM to 20 mM), which confirmed that these two conditions were not different. We do not think that it is necessary to include this identical result in the manuscript. Thank you for your kind reminder. Per your suggestion, we have added the quantitative information (statistical values with Mean ± SEM) throughout the Results section, and we have also updated some figures by adding new graphs with data standardization and more statistical analysis (Figure 1—figure supplement 4C, Figure 5C and Figure 5F). We believe that our findings are more completely presented and fully addressed in the text with appropriate statistical treatments in the revised manuscript. […] The authors address the potential role of glucose in the development of responsive β-cells, and offer several findings that are interesting, but seem incomplete. The studies showing the delivery of labeled glucose analogs show an apparent non-linearity that suggests there are unknowns not being addressed. A dose of a labeled glucose analog that is 2.5 times higher completely penetrates the core; the smaller dose completely fails, as described. The concentrations used in the glucose studies seem to range widely, from physiological to toxic. Thank you and reviewer 3 for raising the question. We want to emphasize that all our glucose treatments can be sorted into two categories, “acute” and “chronic” treatments. Short-term application of 20 mM glucose is “acute” treatments that were used to evaluate the maximal responses of β-cells to glucose. Given the stimulation was discontinued and replaced with normal bath solution, it did not affect functions of islets cultured in vitro or in vivo in living fish embryos. On the other hand, long-term incubation of fish embryos or mouse neonatal islets with glucose (“chronic” treatments) was used to test potential role of glucose in functional acquisition during β-cell development. Under chronic circumstance, 20 mM glucose is toxic, which also agrees with numerous other reports on glucotoxicity (Wu et al., JBC, 2004; Robertson et al., Diabetes, 2004; Poitout et al., Biochim Biophys Acta, 2006). The non-linear delivery of glucose into the islet core is an interesting phenomenon, which may be results of the balance between absorption of glucose via glucose transporters on cell membrane and diffusion of glucose in the gap between different cells. However, it is a topic out of the scope of the current study and will be a good direction for our future research. We are sorry for the misunderstanding and have removed that sentence from the manuscript. We have sorted out two pieces of evidence that support the specific role of calcineurin/NFAT in β-cell functional development. Firstly, by adding numbers of insulin-positive cells in different stages to the histogram (Author response image 7, Figure 4E and legend, subsection “Glucose-induced calcineurin/NFAT activation to initiate and enhance β-cell functionality”, last paragraph), we show that genetic perturbation of calcineurin did not affect β-cell proliferation at different stages. In addition, we have examined the fish at another elder stage. Despite the progressive functional maturation of more β-cells in control embryos from 72 hpf to 7 dpf, the mean number and response of glucose-responsive β-cells in 7 dpf dn-zCnA embryos were not different from those in 72 hpf dn-zCnA ones. Therefore, β-cell functional maturation is specifically arrested at the stage of 72 hpf in dn-zCnA fish embryos. The calcium imaging and GSIS experiments were conducted at different glucose concentrations because: (1) GSIS assay in mouse was designed to be consistent with zebrafish studies, in which we used 20 mM glucose as the stimulation (Figure 5A-5C); (2) The calcium imaging experiments in mouse islets were added to address reviewer’s previous question, to show the similarities and differences of our work to the previous study from Douglas Melton group (Blum et al., 2012). Therefore, we used 2.8 mM and 16.7 mM glucose to follow Melton’s precedent. Nevertheless, we have done additional experiments to compare calcium activities of islets stimulated under different conditions (from 2.8 mM to 16.7 mM versus from 3 mM to 20 mM), which confirmed that these two conditions were not different. We do not think that it is necessary to include this identical result in the manuscript. However, we could update Figure 5 in our revised manuscript if required. 1) We have changed “we developed a high-resolution two-photon light-sheet microscope” into “we applied a high-resolution two-photon light-sheet microscope”. 2) We have deleted the part of calling calcineurin/NFAT signaling as the “master regulator” of β-cell functional development; instead we simply rephrased that calcineurin/NFAT is a major pathway for glucose-dependent β-cell functional development. Regarding your and other reviewers’ comments on incompletely presented data, we have performed 3 new sets of control experiments and new standardizations of GSIS and maximal amplitude of glucose-induced calcium influx under stimulation and resting conditions (Figure 5C and Figure 5F). We have also added several quantitative information (statistical values with Mean ± SEM) throughout the Results section). We believe that the paper has been substantially improved and provides a complete, solid and interesting story. Regarding the last comment of focusing only on either the zebrafish or the mouse, we want to set an example here: imaging the functional development of β-cells in vivo in the transparent zebrafish embryos provides mechanistic insights into this dynamic process, and the use of neonatal mouse islets to demonstrate the principles found in fish can be extended to mammalian species. In addition to all the findings demonstrated in the paper, we believe to establish such a precedent will also be a significant contribution to the field, which is best summarized by the reviewer 2 as “the microscopy approaches they developed and using the zebra fish islet model, is a great strategy to track the spatio-temporal islet developmental biology”. Yes, images under 1P-SPIM, TPM and 2P3A-DSLM were all deconvolved with R-L algorithm by the Fiji software, as explained in Materials and methods in our manuscript. As the axial resolution of the 2P3A-DSLM is sufficient to resolve individual β-cells, we did not rotate embryos to enable fast sampling speed. We agree with you that the quality of the spinning disc confocal data would be improved if an objective with higher magnification and high NA could be used. However, as the depth of the islets plus the thickness of the culture dish exceeds the working distance of the 25× or 40× objective lens, we were unable to achieve tight focus of the islet in living zebrafish embryos at magnifications greater than 10×. We thank you for the appreciation of our finding. Thank you for this insightful comment. Per your suggestion, we have plotted the histogram of maximal amplitudes of calcium transients from glucose-responsive β-cells in different developmental stages. From the right-shift of the histogram from 48 hpf to 72 hpf, it is obvious that the same population of β-cells gradually become more responsive to glucose. This is a good demonstration of the power of combining in vivo imaging with quantitative analysis. Thank you. We have added this information in our revised manuscript (Figure 1—figure supplement 4C and legend, subsection “Visualization of embryonic β-cell function in vivo using 2P3A-DSLM”, last paragraph). 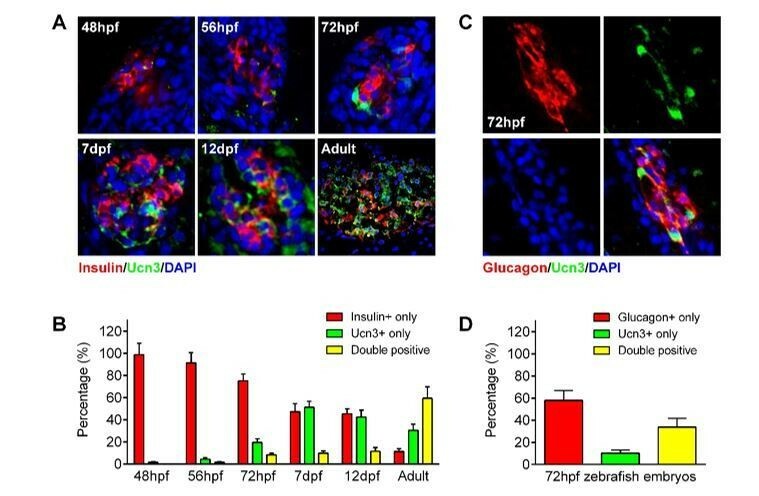 cloche-/- mutant embryos and BDM-treated embryos have similar phenotypes: intact glucose-responsive β-cells at 56 hpf, but the same extent of impaired β-cells responsiveness to glucose at 72 hpf. These phenotypes support the conclusion that glucose, which is delivered to the β-cells through penetration from YSL at 56 hpf or through blood circulation at 72 hpf, is the trigger signal of β-cell functional development. On the other hand, you are perceptive in pointing out that we could not exclude the possibility that β-cell functional maturation may cause these cells to secrete a factor that promotes angiogenesis. When we used CGA to rescue their phenotypes, BDM-treated embryos showed more complete rescue of the maximal calcium influx than cloche-/- mutants (Figure 4—figure supplement 1), which may indicate possible involvement of vascular endothelial cells. However, more future experiments are needed to confirm or disprove the hypothesis. 5) I felt that the authors data from the cloche mutant and their dnCalcineurin line were more convincing than their data from pharmacological reagents for which I'm always concerned about off target effects. How specific are these particular reagents? The authors say they did careful dose response curves but the control I would really like to see is if the drugs affected calcium signaling in a totally unrelated cell like a CNS neuron. Do calcium levels change in these cells with drug treatment? Following your suggestions, we have done additional control experiments to test possible off-target effects of these pharmacological reagents (10mM BDM, 3mM 3-MPA, 10uM FK506 and 141.2 μm CGA) on neuronal activities. We measured calcium activities from CNS neurons in Tg (elavl3:Gcamp6s) zebrafish, in which neurons were labelled by the calcium indicator Gcamp6s. The result showed that the calcium dynamics in CNS neurons were not affected by any of these pharmacological treatments, supporting their specificity in affecting β-cell functional development only (Figure 4—figure supplement 2 and Author response video 1). We have added this important information in our revised manuscript (Figure 4—figure supplement 2 and legend, subsection “Glucose-induced calcineurin/NFAT activation to initiate and enhance β-cell functionality”, last paragraph). I would be more convinced by data from Calcineurin or NFAT mutants. I'm not fond of calling calcineurin/NFAT signaling a "master regulator" as they did in Figure 4. The authors state that calcineurin/NFAT signaling is a major pathway for glucose mediated β-cell development but that didn't seem to be the case for outer cells at 56 hpf? Thank you, we have deleted the part of calling calcineurin/NFAT signaling as the “master regulator” of β-cell functional development; instead we simply rephrased that calcineurin/NFAT signaling is a major pathway for glucose-dependent β-cell functional development. It is interesting that glucotoxicity in fish embryo caused by chronic incubation of 20 mM (Figure 3) is less than mouse islet cultured in vitro (Figure 5). A living organism may have some buffering mechanisms to antagonize the glucotoxicity of 20 mM glucose to β-cells. This subtle difference highlights the importance of performing high-resolution imaging in vivo. Thank you and reviewer 1 for raising the question. We want to emphasize that all our glucose treatments can be sorted into two categories, “acute” and “chronic” treatments. Short-term application of 20 mM glucose is “acute” treatments that were used to evaluate the maximal responses of β-cells to glucose. Given the stimulation was discontinued and replaced with normal bath solution, it did not affect functions of islets cultured in vitro or in vivo in live fish embryos. On the other hand, long-term incubation of fish embryos or mouse neonatal islets with glucose (“chronic” treatments) was used to test potential role of glucose in functional acquisition during β-cell development. Under such circumstance, 20 mM glucose is toxic, which also agrees with numerous other reports on glucotoxicity in β-cells (Lan Wu et al., JBC, 2004; R. Paul Robertson et al., Diabetes, 2004; Poitout et al., Biochim Biophys Acta, 2006). Our experiments on neonatal mouse islets agreed nicely with previous works (Blum et al., 2012), which demonstrated mouse β-cell maturation involves the reduction in low-glucose-stimulated insulin secretion. Furthermore, we showed that glucose-stimulated calcium imaging data is faithfully consistent with GSIS results in our ex vivo study with neonatal mouse islets (Figure 5). Therefore, despite that it is impossible to measure insulin secretion from individual zebrafish embryos, we believe that glucose-stimulated calcium responses is a good approximation for β-cell function in fish embryo in vivo. In this sense, although we only used drugs to manipulate the calcineurin/NFAT pathway in mouse islets cultured in vitro, we did reach conclusion consistent with zebrafish experiments regarding the β-cell functional development: calcineurin/NFAT mediates the inductive roles of glucose in increasing high-glucose-stimulated insulin secretion. “However, it is interesting that glucotoxicity in fish embryo caused by chronic incubation of 20 mM is less severe than expected, suggesting that living organism may have some buffering mechanisms to antagonize the glucotoxicity of 20 mM glucose to β-cells.” (Subsection “Fine glucose concentrations regulate the heterogeneous development of β-cell function in vivo”, last paragraph). Thank you. Following your suggestion, we have mentioned this information “inside = core and outside = mantle” at its first appearance in the Figure 2 legend of our revised manuscript. Thank you. We have corrected the grammatical mistake in our revised manuscript. We thank Dr. Lin Shuo, Dr. Zhang Bo, Dr. Chen Jau-Nian, Dr. Liu Feng and Dr. Florian Engert for sharing the fish lines with us. We thank Dr. Liao Bo-Kai, Ms. Zheng Ruyi and Ms. Meng Liying for technique assistant. The work was supported by the grants from the National Science and Technology Major Project Program (2016YFA0500400), National Natural Science Foundation of China (91854112 and 91750203, 31327901, 31521062, 31570839, 31301186), and Beijing Natural Science Foundation (L172003). Animal experimentation: Animal care, generation of transgenic zebrafish lines, in vivo imaging of the live zebrafish embryos and all other experiments involving zebrafish and mouse islets were approved by the IACUC of Peking University in China (reference no. IMM-ChenLY-2). © 2019, Zhao et al.